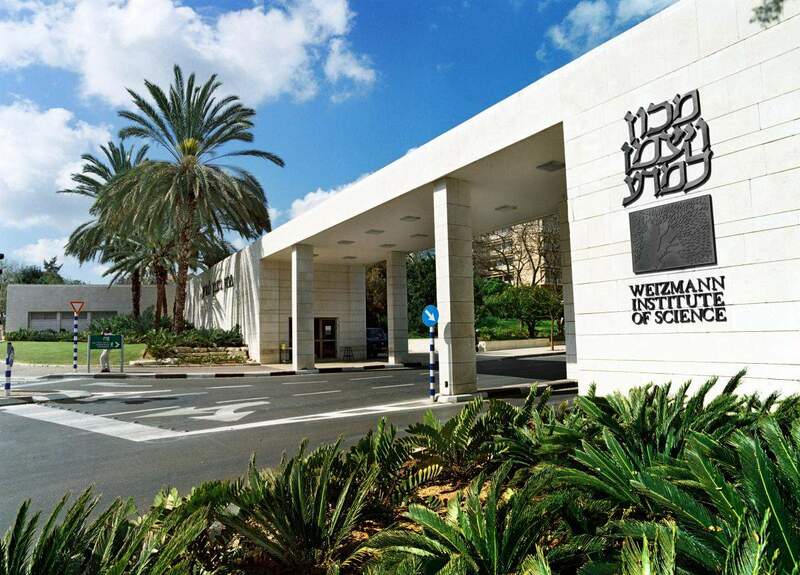 The Weizmann Institute of Science is one of the world’s leading multidisciplinary basic research institutions in the natural and exact sciences. The Institute’s five faculties – Mathematics and Computer Science, Physics, Chemistry, Biochemistry and Biology – are home to 2,600 scientists, graduate students, researchers and administrative staff. 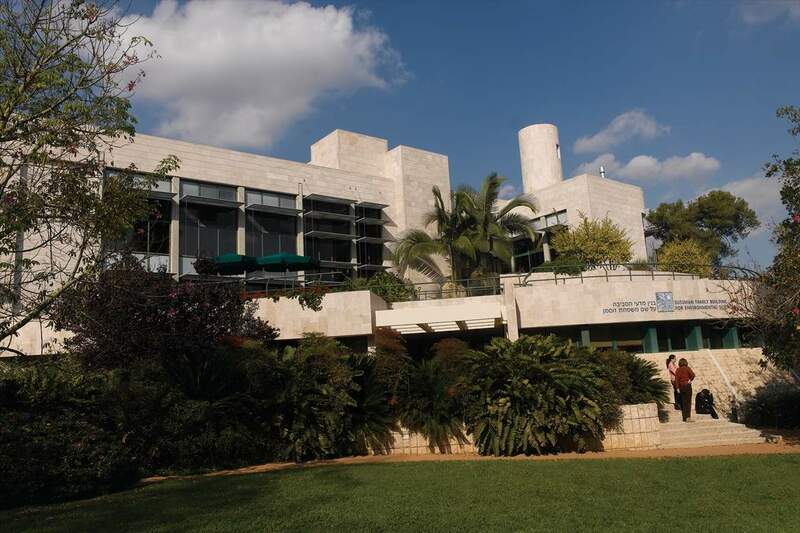 The Daniel Sieff Research Institute, as the Weizmann Institute was originally called, was founded in 1934 by Israel and Rebecca Sieff of the U.K., in memory of their son. The driving force behind its establishment was the Institute’s first president, Dr. Chaim Weizmann, a noted chemist who headed the Zionist movement for years and later became the first president of Israel. 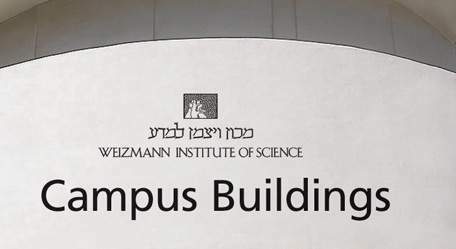 In 1949, the Institute was renamed and formally dedicated as the Weizmann Institute of Science, in honor of Dr. Weizmann’s 75th birthday. 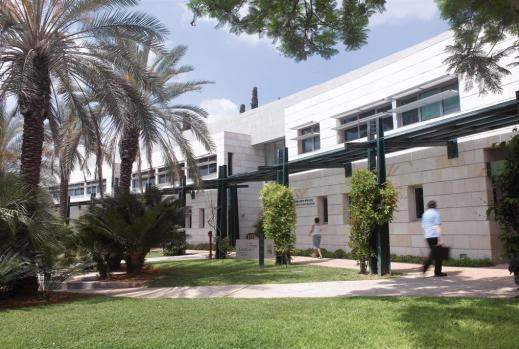 Over the years, the Weizmann Institute has grown with the country, and it has been the site of a number of scientific milestones. Institute scientists were pioneers in the field of cancer research. Others planned and built one of the first electronic computers in the world, and the first in Israel. They were among the first to establish a company for transferring knowledge from academia to industry (Yeda Research and Development Co. Ltd.), and they initiated the founding of a science-based industrial park near the Institute. The Institute has also been the site of pioneering research in brain studies, nanotechnology and new methods for exploiting solar energy. Research by Institute scientists has led to the development and production of Israel’s first ethical (original) drug; the solving of three-dimensional structures of a number of biological molecules, including one that plays a key role in Alzheimer’s disease; inventions in the field of optics that have become the basis of virtual head displays for pilots and surgeons; the discovery and identification of genes that are involved in various diseases; advanced techniques for transplanting tissues; and the creation of a nanobiological computer that may, in the future, be able to act directly inside the body to identify disease and eliminate it. Today, the Institute is a leading force in advancing science education in all parts of society. 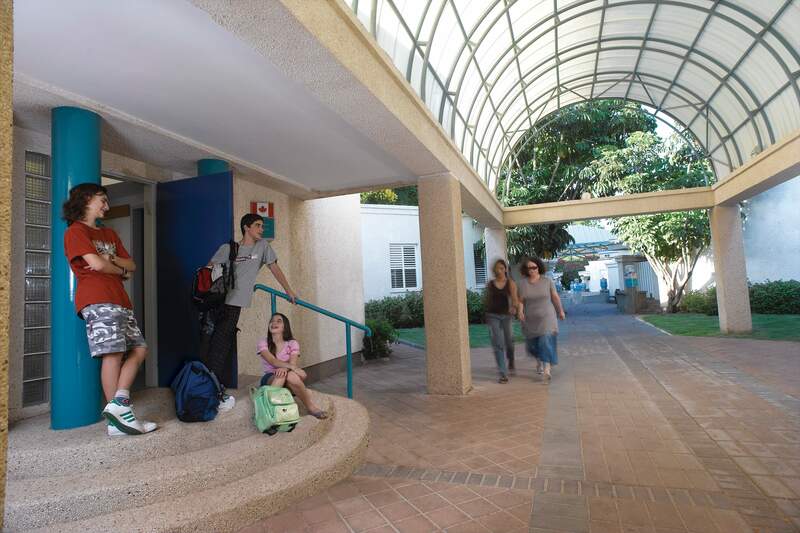 Programs offered at the Davidson Institute of Science Education, on the Weizmann campus, target exceptional and science-oriented students as well as high school dropouts, elementary through high school teachers, students of all ages and adults. The Clore Garden of Science offers fun-filled interactive science activities for people of all ages. The Institute campus is a living museum of architecture; it showcases a stunning collection of edifices built in the variety of styles current between 1934 and today. These begin with Middle-Eastern motifs and the International Style of Erich Mendelsohn, run through Brutalism’s exposed concrete forms, Structuralism, Formalism, Postmodernism and Glass Architecture, up to the most recent contemporary additions. The visitor strolling around the campus paths will encounter some of the main crossroads in the history of Israeli architecture. 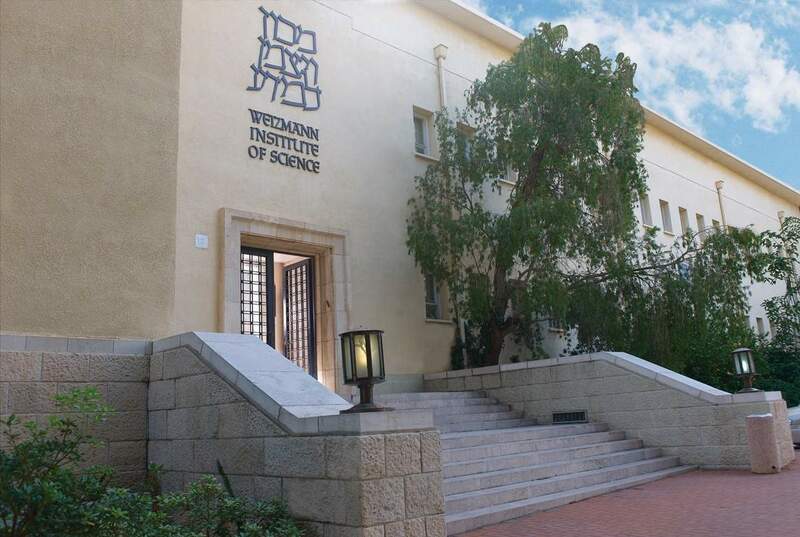 The Daniel Sieff Research Institute, which gave rise to the Weizmann Institute of Science, was established in 1934 on the initiative of Dr. Chaim Weizmann. It was built with a donation from Israel and Rebecca Sieff, among the founders of the Marks & Spencer chain of department stores, who wished to commemorate their son Daniel. The inscription in three languages – English, Hebrew and Arabic – on the front of the building testifies to Weizmann’s vision of peace, comradeship and joint enterprise between Jews and Arabs. The building was designed by Benjamin Chaikin. The logo on the building is the work of the noted Jewish architect Erich Mendelsohn and, to the best of our knowledge, typographer Francesca Baruch. The well-preserved building and its entrance are characteristic of the period, combining the International Style with typical Mediterranean elements. A striking example is the cornice of the building’s roof, pointed toward the center like a classical Greek pediment. A complicated system of protrusions and depressions emphasizes the cornice, the position of the entrance and the lines of the upper and lower windows. The latter resemble the famous ribbon windows by the French architect Le Corbusier, one of the hallmarks of the International Style. Yet Chaikin, an Eretz-Israel architect, chose not to disconnect the columns from the wall, creating a ribbon window using depressions only. While the original wooden roll-down shades have not survived, the building’s central staircase is exceptionally well preserved and deserves to be an object of pilgrimage by historians, conservation architects and all nostalgia aficionados. Here one finds materials and decorations of a rare quality: light-gray Carrera marble for the floor with two black stripes running along the sides of the corridor; iron balustrades with geometrical straight lines and barred iron newel posts at the corners; and a stylized wooden handrail. The iron entrance door is also the work of a master craftsman. Each of its heavy wings is 2.5 meters high. On the second floor is the lab in which Dr. Weizmann conducted his numerous research projects, preserved as if the scientist had just stepped out to lunch and will be returning shortly. Displays include various research installations and original wooden furniture. The Weizmann House was designed by the noted architect Erich Mendelsohn in 1936 to serve as the private residence of Dr. Chaim Weizmann and his wife Dr. Vera Weizmann. They chose to build their house on a hill near the Daniel Sieff Research Institute, founded by Chaim Weizmann in 1934. It was the first building designed by Mendelsohn in Eretz Israel, constructed in the Modernist International Style and referred to in popular parlance as “the palace,” due to its hilltop location and its size: It covers an area of 1,000 square meters and is surrounded by a 10-acre garden. The design of the house, influenced by Le Corbusier’s Villa Savoye, combines a number of International Style principles with design elements and materials that, at Weizmann’s request, were local, such as the Hebron-stone floors. The U-shaped structure is designed to surround a west-facing swimming pool, such that the sea breeze ripples the pool’s water and helps lower the temperature, as do the fountains and decorative pools of traditional Arab and Mediterranean construction. Traditional elongated doors lead to the swimming pool, which is flanked by two arcades of four columns each. Two of these columns on the western side support a flat roof. The building incorporates several naval motifs, including porthole windows on the side and, centered between the building’s two wings, a cylindrical structure, the stairwell of an imposing spiral staircase, which stands out like a captain’s command post. The building’s two wings also include a guest room on the northern side and a library recessed into the particularly thick southern wall, home to 1,200 books in six languages: Hebrew, English, Russian, German, French and Yiddish. 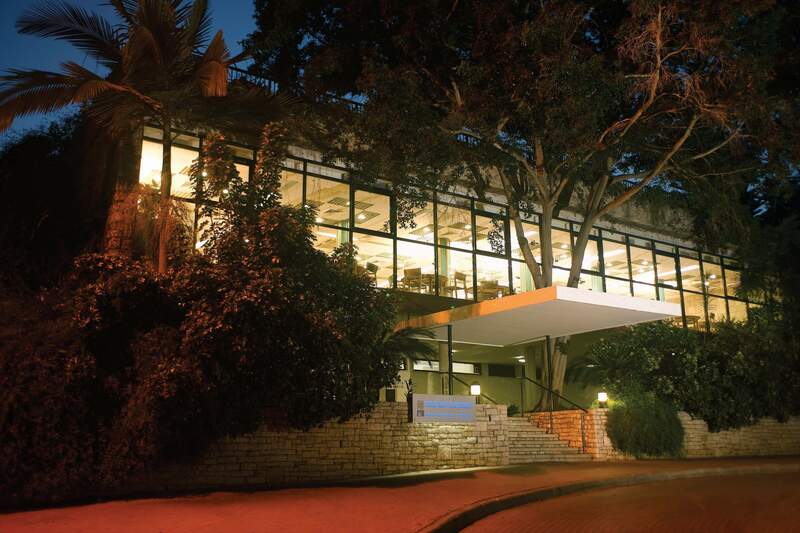 Though the unique western façade has become the most recognizable hallmark of the Weizmann House, it is the southern side that contains the official entrance, projecting functional modesty and masking the splendor of the interior. This modesty also characterizes the grave of Chaim and Vera Weizmann in the garden. The double tombstone was fashioned after the tombstones of missing soldiers in Great Britain, in memory of their son Michael, a Royal Air Force pilot whose plane was shot down over the Bay of Biscay in World War II. 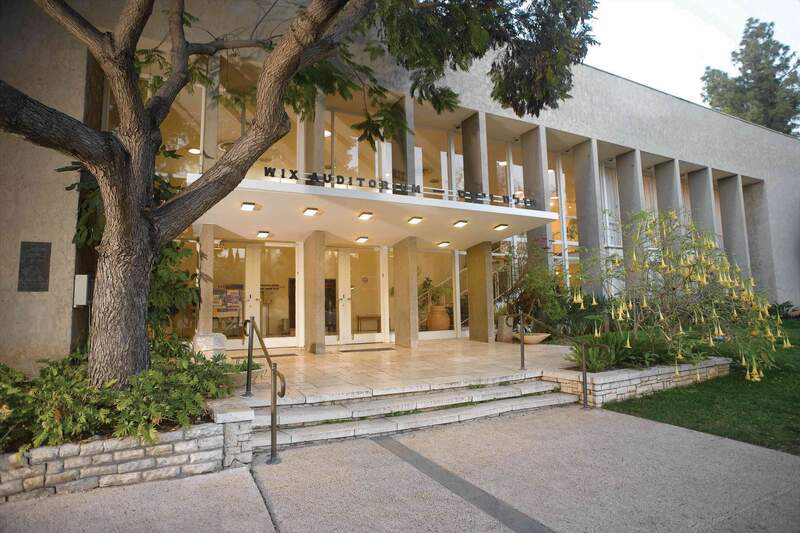 In 1999, the Weizmann House was renovated according to the design of architect Hillel Schocken. The Daniel Wolf Building, designed by the architect Erich Mendelsohn in 1939, was for many years neglected and divided up into numerous partitions, until in 1998 a decision was taken for its conservation. 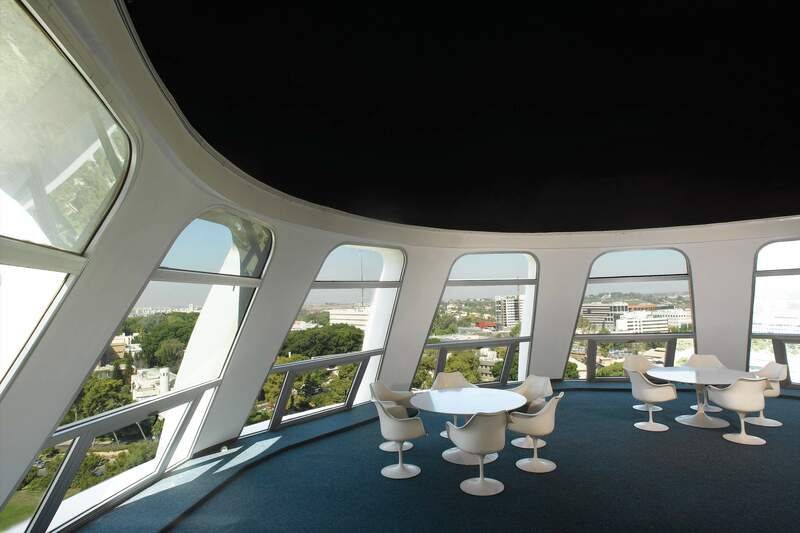 Architect Dagan Mochly had all the partitions removed to expose the building’s reverse-parabola inner space. 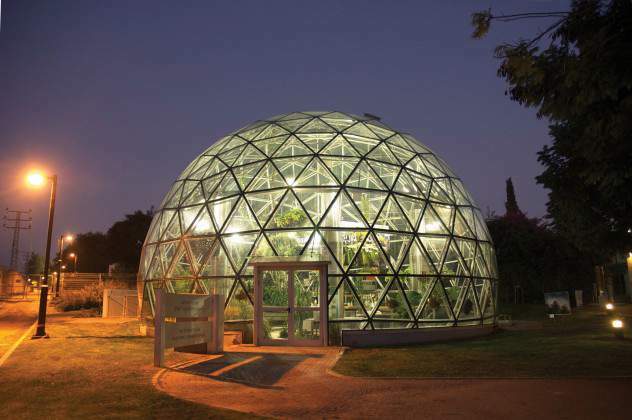 This is one of the most interesting structures built by Mendelsohn in Israel – or anywhere else – and it is unique in every respect as a research/industrial building. Its tiled, pointed-arch roof is one of a kind at the Weizmann Institute and among Mendelsohn’s works. It resembles the barns and factories that were widespread in Europe in the early twentieth century. One such is Peter Behrens’s 1910 AEG turbine factory, famous for its simple shape and barrelvaulted roof, which has become an icon and a harbinger of Modernism in its early German version, the Jugendstil (“youth style”). In designing the Wolf Building 30 years after Behrens’s turbine factory, Mendelsohn gave a new meaning, in the spirit of the International Style, to the vaults familiar to him from Germany. 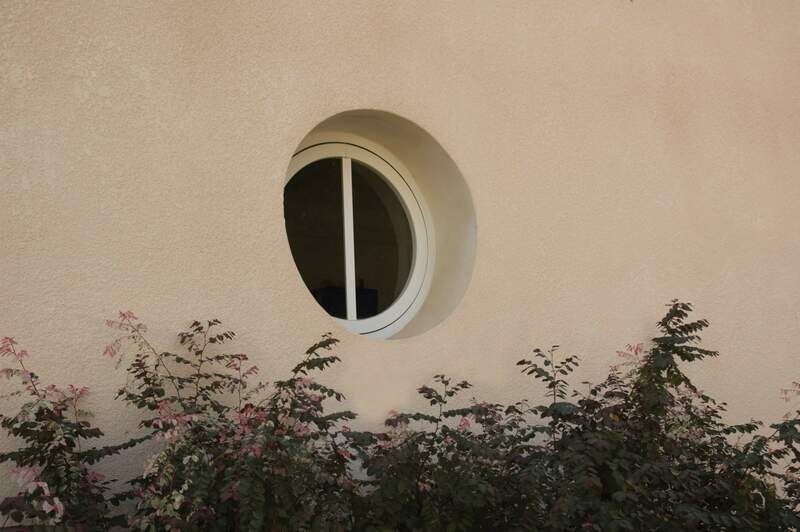 As in the Weizmann House, whose round windows were nautically inspired, Mendelsohn turned this entire building into a large upside-down ship; its hull serves as the roof while its portholes appear on the façade. The uppermost windows of the building are not part of the ship motif; they have a practical purpose: to release hot air accumulating in the upper part of the vaulted ceiling. An air-conditioning conduit was added there in the 1998 renovations to improve ventilation. Additional square windows in precast concrete frames are set directly between the prominent arches that build up and support the vault. While the central space, with a high vaulted ceiling, is intended for scientific installations, additional low-ceilinged areas on the sides, whose straight roof protrudes from the walls of the ship, provide office space. The central space today contains advanced magnetic resonance imaging machinery; its installation required that the amount of iron in the vicinity be significantly reduced so as not to interfere with the functioning of the magnetic equipment. For this reason, the floor was cast anew with stainless steel rather than iron rods, and the original iron doors replaced with aluminum ones. The Ruthie and Samy Cohn Building for Magnetic Resonance Studies in Structural Biology, designed in 1939 by the architect Erich Mendelsohn, was restored and renovated in 1998 according to the design of the architect Dagan Mochly. This is a simple building, whose main distinguishing features are the white trapezoid roof that connects it to the Helen and Martin Kimmel Center for Archaeological Science and the matching white trapezoid chimney. The chimney was part of the installation that produced heavy oxygen isotopes used mainly in biomedical research. Outside the building is a plaque describing this pioneering scientific enterprise. To accommodate the large nuclear magnetic resonance machines, the building has been outfitted with an insulated, shock-absorbing concrete floor, with the layer beneath cast of stainless steel rods to avoid the presence of iron near the large magnet. For the same reason, the frames of all the doors and windows, formerly made of iron, have been replaced with aluminum. During the reconstruction, a passage was created under the building’s long roof by the landscape architect Dan Zur. It consists of a square with a fountain, a water conduit and semicircular steps. From this square, a long vista leads all the way to the Clore Garden of Science. The Cohn Building is one of four structures surrounding the square – all of them designed by Mendelsohn. In this sense, the spot is unique anywhere in the world. The Helen and Martin Kimmel Center for Archaeological Science was designed by Erich Mendelsohn in 1939 and renovated according to the design of the architect Dagan Mochly in 1998. It belongs to the complex of buildings by Mendelsohn in this part of the campus. Located on the northern side, it, together with the Daniel Wolf Building across the walkway, creates an entrance gate to the Mendelsohn complex. While a certain symmetry of size exists in their façades, producing the impression of a gateway, the two buildings are opposed in the design of their windows. The windows of the Daniel Wolf Building that face the road are rectangular, although one large window on the side is round, in line with the “inverted ship” design. In contrast, the front windows of the Helen and Martin Kimmel Center for Archaeological Science facing the road are round, while those that face the adjacent building are square. The Jacob Ziskind Building was designed by the architects Arieh Elhanani, Israel Dicker and Uriel Schiller in 1947; a new wing was added to the back of the building in 1960. Planned according to a sketch by Erich Mendelsohn, the building’s general structure is monumental and official looking, while its repeating office windows project a no-nonsense functionality. The accentuated entrance, the wide staircase and the barrel-vaulted ceiling covering the entire lobby create a feeling of majestic splendor. This entrance served as the stage from which Dr. Chaim Weizmann, David Ben-Gurion, Golda Meir and others delivered speeches at the dedication of the Weizmann Institute of Science. In contrast to the flat, functional façade modestly faced with light-colored plaster, the entrance is accentuated by a stone handrail, with glass-and-iron Modernist lamps on either side and an impressive stone frame around the entrance door. The door itself has been artistically crafted as a network of double iron grills with iron protrusions at their intersections. The inner doors, leading from the entrance lobby to corridors with rooms on both sides, are similarly fashioned and are framed in the same brown marble as that used for the floor tiles. The main entrance door opens to reveal a simple lobby that nonetheless has an air of magnificence – and not only because it houses WEIZAC, the first computer built in Israel in 1954. The large space, with its high barrel-vaulted ceiling, superior materials and unique construction details, reflects quality and excellence. Incorporated in the ceiling are glass bricks to admit natural light, and embedded on the underside of the upperfloor balconies are large round lamps. The double-rod balustrade and handrail lining the wide staircase to the upper floor are of copper rather than plain iron. Even the baseboard is of 20-cm-high brown marble tiles, almost three times the standard height. The air-conditioning system, designed when the building was constructed, won it renown as the first air-conditioned building in the Middle East. 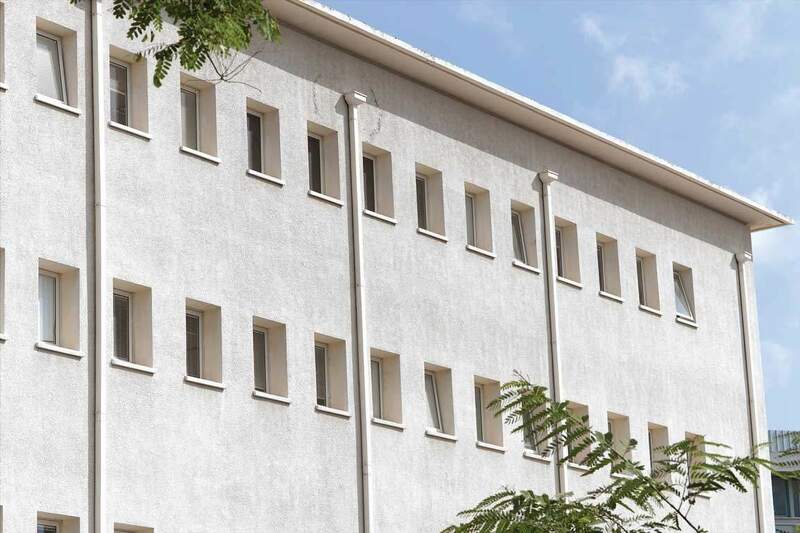 The Isaac Wolfson Building, designed by the architect Arieh Elhanani in 1953, is a classic example of an office building in the late-1940s International Style, so prevalent in Israel in the first years of the country’s existence. Its main features are clearly apparent in the rectangular proportions, the divisions into separate prominent blocks on the northern façade and the use of strong horizontal elements such as the roof cornice protruding by about 50 centimeters, with a deeply accentuated groove that functions as a “drip” to draw rain water away from the wall. Also characteristic of the period are the building’s simplicity and minimalist style. For example, there are no extravagant artistic features, such elements as glass bricks or oversized windows. Instead, the designers and builders have limited themselves to stucco: differences in its texture and method of application (for example, in the balustrade of the staircase leading up to the building) create variety and interest. Only around the entrance is the plaster replaced by finely chiseled white stone with French doors – wooden and glass doors with iron mullions designed to protect the glass, as well as a black 80-cm-high iron grille on the outside. The side façade, though simple and narrow, is nonetheless unique. The building’s entrance has no impressive lobby or other entrance space – a modesty characteristic of the austerity period in Israel. The staircase connecting all the floors is located immediately inside the entryway. The terrazzo steps, the wooden handrail and the iron balustrade, which “speaks the language” of the French door frames on the façade, are all characteristic of the period. But the building did include an air-conditioning system from the outset, only the second on campus (after the Jacob Ziskind Building) to do so. The Michael and Anna Wix Auditorium, designed by the architects Arieh Sharon and Benjamin Idelson in 1955, is the largest performance hall (620 seats) on the Weizmann Institute campus, with a large, well-equipped stage. True to Modernism, it lacks decoration; its majestic splendor is inherent in the building itself. Ten double-height columns support the building’s massive roof – a modern interpretation of the Hellenistic temples and public buildings that were fronted by rows of columns supporting a triangular pediment, such as the famous Temple of Nika or the Parthenon in Athens. Here, the classic columns and triangular pediment have given way to plaster-coated rectangular columns, which support a massive straight gable. At night, lighting installed above the narrow space between the columns and the building’s glass façade adds to the dramatic impact of the tall columns, with their narrow sides facing outward. Much attention has been paid to the design of the entrance canopy. Light-colored plaster connects the canopy to the building itself, behind supporting dark columns. The nine lamps of the canopy’s underside illuminate and mark the entrance. The sign above it projects modesty, with its black letters, in a font characteristic of the period, held up by two white lines. The wide lobby, too, is designed in the Minimalist Style, using simple materials. The division into levels separated by stairs creates several event areas: The lower level functions as a reception room with a buffet and is accessed by three wide stairs flanked by a ramp providing access for the disabled; the upper level has a door leading to the upper part of the auditorium. In 1978, the stage was widened, actors’ dressing rooms were provided and the air-conditioning system was upgraded. The Edna and K.B. Weissman Building of Physical Sciences, designed by the architects Arieh Sharon, Nahum Zalkind and Benjamin Idelson in 1957, at first glance appears to be typical of the Functionalist-Minimalist Style based on the repetition of components, as was common in office and public buildings at the time. The protrusion of the floors beyond the line of the windows on the façade suggests the internal division of the building into two stories and a basement. The heightto- length ratio (the length being 72 meters) is 1:9, giving the building a long, flat appearance. At a second glance, however, it becomes apparent that Functionalism-Minimalism has here received an individualized interpretation affected by the architects’ aesthetic preferences. Since the building faces south, effective shade should have been achieved by horizontal panels. Yet such panels would have excessively emphasized the building’s squat appearance (already accentuated by the protruding lines of the floors). Therefore, to break up the long horizontal effect, the architects opted for vertical shading panels. Looked at from the side, these panels alter the impression of the building’s façade, as the dense sequence of panels seem to conceal the windows, as if obscured behind a lattice. The symmetry and repetitiveness of these shading panels are abruptly halted at the building’s entrance: two round columns support the frame of the canopy and a step of red terrazzo continues indoors with the floor tiles of the lobby and the staircase that rises to the second floor – like a red carpet. The Ullmann Building of Life Sciences, designed by the architects Nahum Zalkind and Moshe Harel in 1963, is almost fully symmetrical both inside and out. The symmetry, characteristic of the classical Greek and Roman styles and the post-medieval Renaissance, endows such structures with an aura of stability and respectability. They have a rectangular layout and a centered, accentuated entrance with matching windows on either side. Well-known examples are Hellenistic temples and public buildings, as well as the sixteenth-century villas designed by the architect Andrea Palladio in northern Italy. The Ullmann Building projects symmetry in the classical sense, but with a modern touch. It is designed around a square inner garden, similar to the traditional patios of Greek residential buildings; but in this case, the patio also contains a memorial to German Jewish scientists persecuted or killed by the Nazis. On the outer façade of the building, the classical windows surrounded by blank walls have been reduced to a single large window in the center, flanked on either side by matching walls of sawn stone uninterrupted by any window or opening. The single aperture – the entrance door, off-center and slightly to the left – breaks the symmetry in the spirit of Modernism. The building has accented fire escapes characteristic of the 1960s, as well as a basement floor with a service tunnel underneath. The building’s interior was designed by the architect Josef Mochly. The entrance is in the transparent part of the façade. To accentuate the lack of symmetry, the door has a very prominent concrete canopy, which appears detached but is discreetly connected to the building at its back, while the front is supported by two round steel columns. This canopy corresponds to the three horizontal concrete lines that protrude somewhat from the plane of the building, marking the ceilings of the three floors while introducing a strong horizontal dimension. 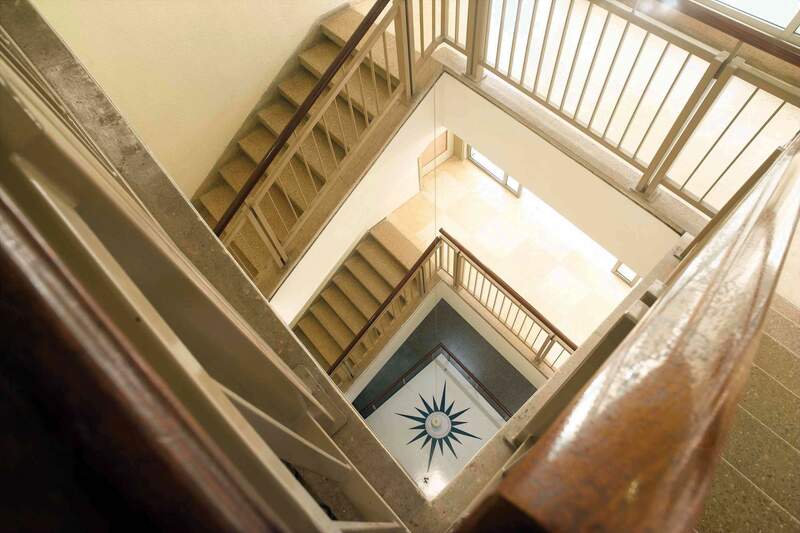 Inside, the symmetry is also disrupted – in this case by the flights of stairs connecting the three floors being positioned at a slight, almost imperceptible angle to one another. But, all in all, the result is a stable, classical structure projecting respect for a long-standing cultural tradition. This tradition was upheld by the architect Zadok Sherman, who designed an additional prominent entrance to the building in 1997. The Charles Clore International House was designed by the architects Arieh Elhanani and Nissan Canaan in 1963. Whereas all the research buildings are on the northern side of the campus’s main road, this student dormitory is on its southern side, as are the visitors center and the scientists’ residences. The Clore House stands adjacent to the main entrance gate; its southern side has an exit leading onto Hanassi Harishon Street and the town of Rehovot. This plan allows for a clear separation between the areas of research and those intended for the business of daily living. The Clore building itself was designed in the spirit of Brutalism, a style in which numerous student dormitories in Israel were built at the time, featuring exposed concrete and components that create repetitive motifs – for example, those produced by the rails and partitions on the balconies. Yet the front façade of the rooms also incorporates other materials and colors that tend to soften the harshness somewhat, such as the reddishbrown wooden panel on each balcony that hides the sliding space for the white shutter covering the narrow glass door. Such proportions are typical of the style and the period; sliding glass doors that provide full access to the balcony appeared only in later years. The building’s two upper floors together have 24 residences. Additional rooms are located in the basement and on the roof. The building has 82 residential rooms in all, 35 single and 47 double. The spacious ground-floor foyer is exceptionally well preserved, including furnishing elements characteristic of the 1960s: formica benches and wooden seating corners. Some of these face the outdoor greenery beyond the glass wall, while others face inward, toward the wall relief by Dani Karavan. 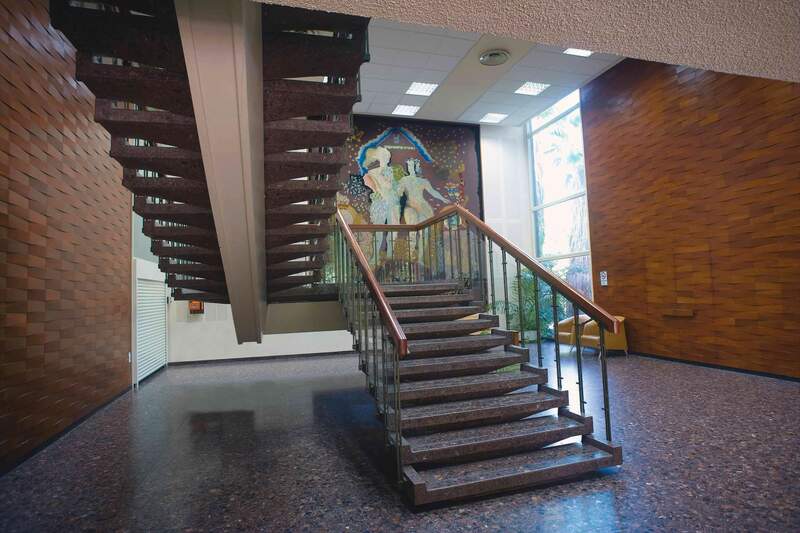 This residential building differs in its materials from all others on the campus: the foyer has a wall-to-wall carpet alongside the relief and an additional long carpet in the seating area near the windows; the floor is of terrazzo tiles of an uncommon shape: long and narrow (10 x30 cm); and in the small music room that serves as a club adjacent to the foyer, an external wall faced with large river stones continues through to the outdoor wall. All these elements, along with the trees and the lawns, create a soothing, cosy atmosphere. The San Martin Faculty Clubhouse and the Hermann Mayer Campus Guesthouse – Maison de France (which was built later) were designed by the architects Arieh Sharon and Benjamin Idelson in 1959 as a two-story building. One of its floors temporarily housed the offices of the Institute’s administration. In 1966, when the administration moved to the Stone Building, the building was redesigned for use as a guesthouse by the architects Benjamin Idelson and Gershon Zippor, with interior design by Rafi Blumenfeld and Lazar Hizkiya. The redesign involved changes in the interior, the addition of a third floor to match the existing ones and, at a later stage, the opening of a second entrance on the northern side. It is obvious from its appearance that the building was intended not for research or study but as a clubhouse and guesthouse. Its style, typical of guesthouses built during that period throughout Israel, reflects the socialist and communal spirit prevalent in the country at the time. The guest rooms are at the front of the building and have long, deep balconies that connect all the rooms on each floor and are separated by tall, prefabricated partitions. Helping to bear the weight of the balconies are slender, round steel columns that match the balconies’ iron balustrades. The entrance area has unusual concrete structures: round columns scrubbed to accentuate the large aggregate from which they were derived and hexagon-shaped outer tiles, whose net pattern matches that of the concrete entrance staircase. The ground floor provides access from one side of the building to the other. At its center, a wide staircase leads up to the clubhouse, with a wide, double-height window through which southern light filters past climbing plants into the central space. Additional light enters the stairwell from the roof through a greenish glass elevator shaft that was constructed in 2002 by the architects Gershon and Barak Zippor. The Stone Administration Building was designed by the architects Arieh Elhanani and Nissan Canaan in 1966, in the style of Industrial Minimalism characteristic of the period. It resembles office buildings of the time – such as the Tel Aviv municipality built a year earlier – whose characteristic features included a large balcony supported by columns rising from the ground floor. The light, sandcolored façade of the Stone Building has repeated white elements, including pyramids in the bottom part of the windows and a simple pattern of vertical and horizontal shading elements, which emphasize modesty, simplicity and a focus on functionality. The building is located close to the Institute’s main entrance gate and projects official, matter-of-fact respectability. In the spirit of functionality, the monumental staircase that originally led from the street and the lower entrance to the upper lobby was later dismantled and replaced by a passenger drop-off lane for Institute visitors. The pyramid motif of the windows repeats itself in the four pyramids that allow light into the drop-off area from the roof, which itself serves as an external balcony to the lobby on the mezzanine floor above. This balcony, the building’s central focus, links up with the parking lot used by people working in the building and by its visitors. The spacious mezzanine floor, with design elements characteristic of the period, has a relief wall by Naftali Bezem, indoor and outdoor seating and external rolldown shades that protect the windowed lobby from sunlight. The shades, installed when the building’s entrance was changed, were placed between prominent rectangular columns and beams. The beams, protruding from the columns, have been deliberately accentuated, while the columns are themselves separated from the contour of the building, providing an open façade for the glass that defines the lobby, so as to impart a sensation of lightness and a hovering feeling for the large mass of the five office floors above. These upper floors are accessed by a staircase of brown terrazzo, which also, as it reaches the lobby, creates a sensation of hovering above the lobby’s floor, whose greenish terrazzo contrasts with the brown of the staircase. 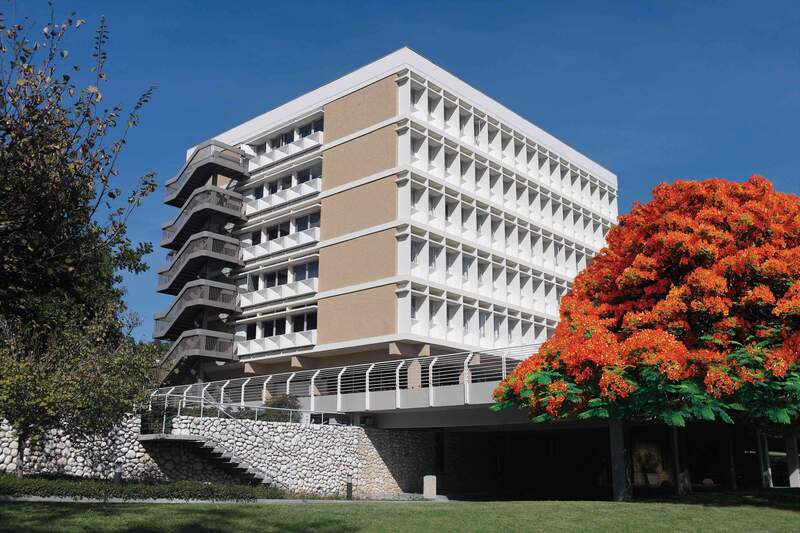 The Wolfson Building for Biological Research was designed by the architects Benjamin Idelson, Gershon Zippor, Nahum Zalkind and Moshe Harel in 1968 as a six-story building. This is one of the most massive buildings on the campus of the Weizmann Institute of Science. Yet, despite its height, it projects a reserved modesty accentuated by its straight lines. In the spirit of architectural Functionalism, its business-like appearance derives from the purposes it serves. In 1983, the architect Gershon Zippor, who had been responsible for planning the original building, added two more floors. Since the architect and builders managed to secure the services of the same quarry that had supplied the stone for the facing of the first five floors, the addition has not affected the appearance of the façade. On the façade, two long horizontal stone rows demarcate each floor, with a row of windows between them. The building’s entrance has a prominent canopy, which in the spirit of Functionalism has an additional purpose: it serves as the floor of the large balcony on the level above, where scientists can get together informally. In contrast to the building’s light external stone and the Functionalist style, the entrance lobby, designed by Rafi Blumenfeld and Lazar Hizkiya, surprises the visitor with its elaborate wooden walls of threedimensional trapezium panels. The observer can spend several minutes trying to figure out how the unique three-dimensional effect is produced by a mere juxtaposition of these panels. This wooden wall, however, is not just for artistic and aesthetic purposes; it creates a partition between the building’s lobby and the lecture hall, although only a sharp eye will detect the hall’s two doors hidden in the wooden wall: even their protruding handles match the three-dimensional trapezium pattern. The woodwork also serves the acoustic purpose of absorbing noise from the lobby, as does the wall tapestry woven after a painting of Adam and Eve by Jean David. The Perlman Chemical Sciences Building, designed by the architects Benjamin Idelson and Gershon Zippor in 1972, is characterized by the truncated lines of the windows and corners of its façade. This is one of the characteristic features of 1960s’ and 1970s’ architecture; it is connected to Structuralism, with its attempts to break the rectangular box while searching for a new architectural language. Gershon Zippor’s truncated shapes also find their expression in the hexagonal Gerhard M.J. Schmidt Lecture Hall adjacent to this building and in other buildings he designed, such as the 1969 Beit Lynn in Tel Aviv. The building’s façade distinguishes between the “served” and “service” areas. Prominent on the side of the building is the external elevator shaft. Also striking against the background of the office windows on the building’s façade is the structure containing the bathrooms on each floor, located in such a way as to create natural ventilation via the truncated corner windows, echoing the truncation around the office windows and the entrance canopy. This building has two entrances, each at a different level. The main entrance, on the ground floor, faces Marcus Sieff Boulevard. The second entrance, facing Ernst D. Bergmann Avenue, leads directly to the second floor, which includes a gathering place for scientists. A staircase winds upward to the right of the lobby, with light entering from a skylight above. Suspended from the ceiling is an eight-floor-high Foucault pendulum, which charts its path on the stairwell floor in the basement. A 67-meter cable ending in an iron ball suspended from the dome of the Pantheon in Paris was part of the experiment performed by Leon Foucault to demonstrate, among other things, the rotation of the Earth on its axis. The Koffler Accelerator of the Canada Centre of Nuclear Physics, designed by the architect Moshe Harel in 1975, has become an architectural symbol of the Weizmann Institute of Science. This unique building combines two towers. One, shaped like a corkscrew, is 57 meters high; the other, 53 meters high, is topped by an egg-shaped structure 22 meters long and 14 meters across at its widest point. This design belongs to a period influenced by the first achievements in space, by pop music and by the props of science fiction films (such as the futuristic but real home in which Woody Allen’s Sleeper was filmed in 1973). At the time, architectural groups and movements were searching for new ways of expression that would diverge from straightforward, “dry” Modernism. Most famous among these was the Archigram Group, which designed structures so futuristic and radical they were never built. These included transportable buildings with legs and a city whose parts could be removed or added. The accelerator at the Weizmann Institute of Science is clearly related to the Einstein Tower, a solar observatory in Potsdam, Germany, built in the early 1920s by Erich Mendelsohn, the famous architect whose name is inextricably linked with the Weizmann Institute. In the 1970s, the accelerator enabled Weizmann Institute scientists to work at the forefront of world science. With time, however, its experiments reached their completion, and recently it was decided to end its operation. The Koffler building is made of exposed concrete cast under pressure in industrial steel beds, as evidenced by signs of holes in the concrete, and is painted white. One of the concrete towers looks like a mushroom stalk, bulging somewhat in the middle, atop which is the “egg.” The other, the “corkscrew,” is the service tower. The towers are connected by a joint ground-floor structure as well as by three bridges at different levels. The monumental but simple geometry of the accelerator building is a striking example of Formalism in architecture, which can also be seen in such new buildings as the CCTV tower designed by Rem Koolhaas in Beijing and the “antenna towers” designed by Santiago Calatrava in various places around the world, including Berlin, Shanghai and Barcelona. The Canadian Institute for the Energies and Applied Research was designed by the architect Moshe Harel in 1988; its narrow, 52-metertall façade was designed together with the artist Dani Karavan. It rises from Albert Sabin Avenue accentuated by vertical anodized aluminum profiles, four protruding concrete lines spilling into the blue reflecting pool at the foot of the tower and two adjacent central panels that appear to create a water channel leading to the pool. All these features are reminiscent of the Yad Kennedy Memorial in the Jerusalem hills, built in 1966 by the architect David Reznik, and of the Cathedral of Brasilia, designed by Oscar Niemeyer in the same period. The building, a fine example of the Modernist Style, served the study of advanced ways of exploiting the sun’s energy. Methods developed in the building form the basis for the activities of various alternative energy companies in Israel and abroad. 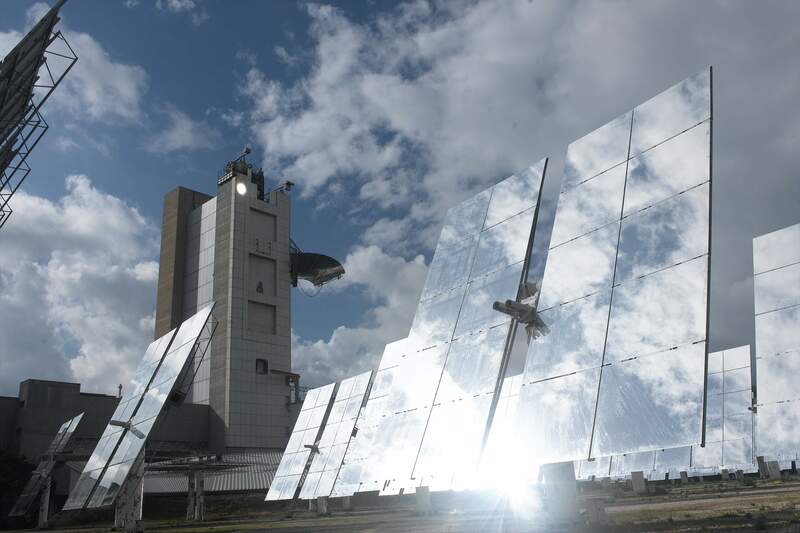 On the ground, north of the solar tower are 64 mirrors, each with an area of 56 square meters, which concentrate the sun’s rays and direct them to the research labs in the tower. The Sidney Musher Building for Science Teaching was designed by the architect Gershon Zippor in 1990. Erected where a pine grove once stood, the building’s presence was minimized by being designed as a glass box growing out of the surrounding lawn and vegetation, which are reflected in its mirror walls. The emergence of this style, eventually to be known as Glass Architecture, can be traced back to the glass-and-steel structures that began to appear already in the midnineteenth century, with the development of iron and steel construction technologies. A hundred years later, glass was already being incorporated into the walls of private houses built – as is the Musher Building – in the heart of green groves. Today there is hardly a modern building without a glass front. Even if not transparent, the walls of the Musher Building are nevertheless made of glass, set in matching anodized aluminum frames of a yellowish color, characteristic of the period. The dark-shaded glass not only conceals what is happening indoors; it also hides the divisions and levels of the building. The interior design includes a gray-linoleum-lined central corridor with rooms on either side, where windows open inward. 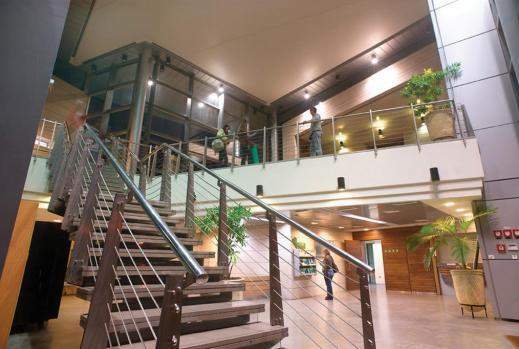 While the corridor’s ceiling is low, concealing airconditioning pipes and other equipment, the offices have high ceilings, whose Spancrete precast hollow concrete panels are in plain view. The entrances to the building, accentuated by striking yellow and red paint, stand out from the simple black glass box. At the main entrance, a yellow metal pyramid directs visitors to the Department of Science Teaching and to the side entrance of the Feinberg Graduate School. Red paint covers the aluminum jamb of the entrance door and the round column in the “missing” corner on the ground floor of the building, which creates a roofed entrance space and breaks up the perfect box. 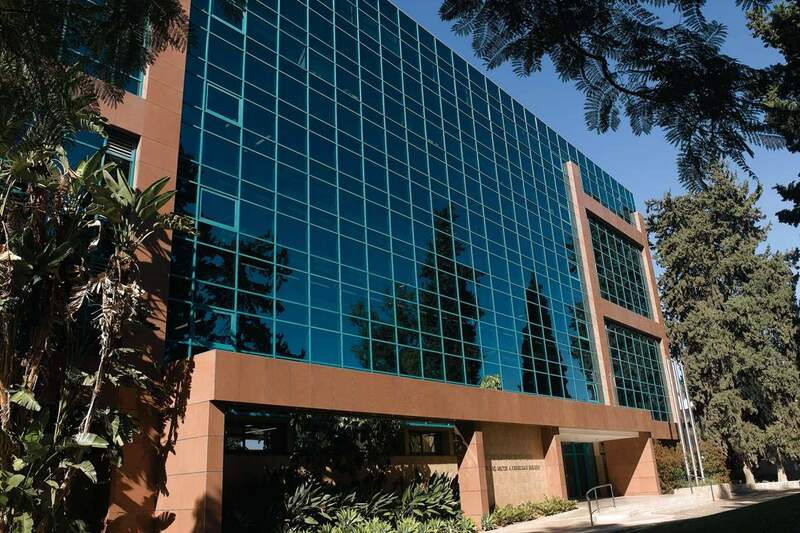 The Hermann and Dan Mayer Building for Semiconductor Science, designed by the architect David Zarhy in 1991, is a good example of the industrialized construction approach prevalent in the 1980s, which involved the use of prefabricated concrete walls faced with stone. By manufacturing the building’s walls together with their external facing, construction time is shortened by eliminating the need for scaffolding to apply the finishing. The method is also more precise, as the walls are created under factory conditions, with close supervision. Its major disadvantages are the need for skilled workers, the high cost of cranes and the difficulty of making changes in the concrete walls once they have been cast. The construction industry has always sought to emulate the efficiency of a car manufacturing plant. Several attempts to achieve this goal were made in the 1960s, the most prominent being Habitat 67, a housing complex designed by the architect Moshe Safdie for the 1967 International and Universal Exposition (Expo 67), in Montreal. But the dream of a house comprised of prefabricated components that would be cheap, aesthetic and amenable to changes in design has yet to be realized. Prefabricated structures are still used mainly for industrial purposes; only during limited periods have they been employed for constructing offices or housing, for reasons of fashion or low cost. The Mayer Building has three floors. 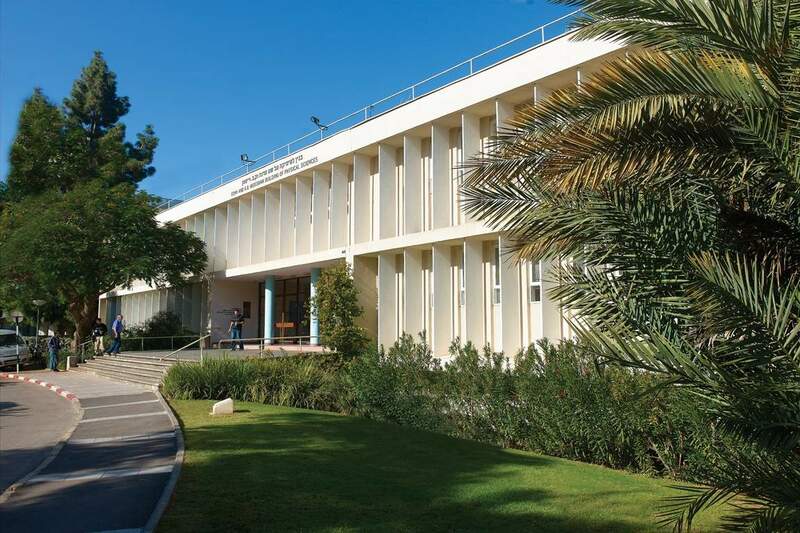 The ground floor contains a variety of technical equipment that serves the research floor above: 400 square meters of special clean labs, the first of their kind in Israel. Built of materials that emit no particles, these labs are equipped with advanced climate control systems supplied by the third floor’s air-conditioning systems that meet stringent requirements for air purity. In the second-floor labs, scientists conduct experiments with submicron semiconductors that are so tiny, they can be disturbed by even the slightest vibrations – for example, from the shock wave resulting from a passing truck. To prevent any such disturbance, special shock absorbers were installed in the foundations of the building. 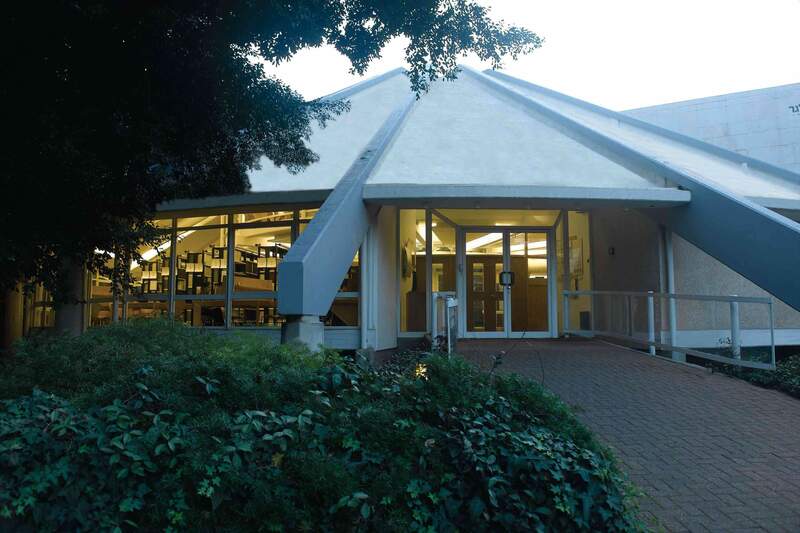 The Maurice and Gabriela Goldschleger Life Sciences Library, designed by the architect Yakov Rechter in 1991, attracts immediate attention by its unusual conical shape. This building is typical of Rechter, who always sought new ways and means of expression, while staying faithful to such veteran heavy materials as stone and concrete. Examples of his work include the Mivtahim Inn in Zichron Ya’akov built on a cliff in 1968, the Performing Arts Center built in Tel Aviv in 1994 and the enormous Holiday Inn dome on Ashkelon beach built in 1998. Here, too, Rechter was able to give free expression to his creative style, as this is a library rather than a research building with complicated engineering requirements. The smooth white concrete roof is supported by exposed concrete columns and beams that create a conical frame, gray and prominent. In contrast, slender, round, white steel columns on the front façade support the ceiling of the reading hall and the floor of the inner gallery, thus preserving the integrity of the glass front wall. To stress its uniqueness and secure the quiet appropriate to a library, the building is separated from the road by a protective moat, one floor deep, spanned by a bridge leading to the entrance door. The impressive exterior of the slanted roof, highlighted by its protruding concrete beams, is continued inside the library in the form of air-conditioning pipes, illuminated by hidden lights in the low ceiling, that follow the lines of the beams. The library’s conical form creates an interesting internal space, in which the entrance floor serves mainly as an archive with seating areas along the transparent front wall, while the tall space in the center is taken up by an overlooking gallery floor that serves mainly as a reading area. The space in the center is filled with ceilingless rooms with round windows, used for meetings and study. The upper gallery is accessed by a concrete staircase with a transparent roof. An additional glass wall in the center of the cone faces a small internal garden. This garden and the planted moat together enfold the building in a swathe of vegetation that serves to somewhat soften the harshness of Rechter’s favored concrete. The Helen and Milton A. Kimmelman Building is, in essence, an extension of the Ernst David Bergmann Institute, a four-story concrete structure designed by the architect Moshe Harel in 1963. In 1994, two floors were added to it, becoming the Kimmelman Building, jointly designed by the architects Gershon and Barak Zippor, Zadok Sherman and Shmuel Potash. Its façades were refaced with a large, modern screen wall of bluishgreenish glass that covers the entire side facing the street, except the ground floor. The glass used in this wall is reflective rather than transparent, and its relative opacity turns it into a oneway mirror on the outside, making it possible to cover the entire building – from the windows to such solid parts as the walls and the concrete floor – in a uniform manner. The resultant appearance is misleading: Rather than revealing to the outside observer what is happening inside the building during the day, the glass turns into a mirror, keeping the building’s interior a mystery. At night, the mirror is reversed: a person inside the building can hardly see the outdoors, while those on the outside can see everything that is happening within the lit rooms. The building, however, is used mainly during the day, preserving the workers’ privacy, while the bushes and the tall cypress trees in the garden are reflected and duplicated in the glass. This innovative technology immediately became a great hit; buildings of this type can be seen in office areas and high-tech industrial parks throughout Israel. In the Kimmelman Building, the architects, for practical and design reasons, have used granite and granite porcelain tiles to cover the concrete protrusions of the extension cables that reinforced the existing building, making it possible to add the two floors. In the entrance lobby, the designers have also used glass – here as a covering to the building’s frame; but this time the glass is transparent, with turquoise inscriptions matching the color of the glass outside. Molded to a rounded shape, the glass serves as a plaque covering the building’s two main columns at the entrance. The reddish floor tiles of the lobby are reminiscent of the exterior stone facing, while the delicate shades of turquoise in the wall painting by David Kedem and Amiram Shamir echo the greenish screen wall. The Martha, Bram, Michael and Philippe Laub International Science Youth Village, designed by the architect Dan Peleg in 1994, is intended for hosting youth from Israel and abroad with the purpose of bringing them closer to science and to the spirit of human curiosity that drives scientific inquiry. The design of the Village differs from that of a regular student dormitory. A plant-covered iron-rod pergola welcomes visitors, directing them to the entrance plaza, where a transparent barrel-vaulted roof points the way diagonally to the Village’s central square. This square, overarched by a transparent pyramid-shaped roof, functions as an amphitheater-like gathering place. The complex follows the design of a small Mediterranean village: white-washed single-story houses cluster around a central square. This layout, along with such classical architectural features as the barrel-vaulted entrance gate marked by an imposing cypress, the pergola-arched pathway, the prominent roof cornices, the pyramid spanning the square’s open-air auditorium and, of course, the square itself – create a pleasant and cozy “village” atmosphere. The housing units are thoughtfully designed and distributed. Each four houses share a mini-square equipped with four wooden benches, creating a meeting place less public than the large square. Each four-unit building is composed of a long rectangle divided in two. Each unit has its own entrance, emphasized by a lamp, on the far side of the rectangle. The approach to each is shielded by a plaster-coated pergola as well as a protective wall, which ensures privacy for the boys and girls. The Sussman Family Building for Environmental Sciences was designed by Raphael Lerman and Dror Sdomi in 1995, in collaboration with Prof. Edna Shaviv – all three architects. The design was dictated by the building’s function: the study of the environment. This is a “green” building; it embodies the principle of sustainability: preserving a balance between society and the environment, to the detriment of neither, while taking heed of the future. Green construction standards now exist throughout the world, the most famous being the U.S. Leadership in Energy and Environmental Design (LEED) system, which served as a guide for the 2005 Israeli standard for green buildings. That standard defines a variety of criteria: the use of environmentally friendly materials (recycled or stemming from renewable resources), energy-saving measures and waste management. A number of green components are readily apparent on the exterior of the Sussman Building: the vegetation that surrounds the building, sun-deflecting grids for keeping the glass cool and planted areas in the central patio of the building and on the roofs, including a flat roof with greenhouses for absorbing hot air and channeling it into the air-conditioning ducts that also heat the rooms in winter. About a dozen different technologies for saving electricity were implemented in the building. The seminar room has ceiling fans that reduce the need for air-conditioning; the labs have pale-colored windowsills that reflect light into the interior. Electricity circuits for areas close to the windows have been separated from those situated in the depths of the building, where illumination is not aided by sunlight. The architect Dagan Mochly was responsible for the interior design of the building, including the labs. These labs have fume hoods, the first of their kind in Israel, that slow down when there is no movement in the room and work in coordination with the air-conditioning system to prevent cooled air from leaking through the hood. A cylindrical chimney makes it possible to release fumes to the atmosphere safely, at a relatively great height. Finally, all the furniture and materials used for interior decoration are environmentally friendly. The building consumes 50% less energy compared with regular labs. In the wake of its construction and in line with the world trend, green construction began to develop in Israel. The Nella and Leon Benoziyo Physics Library was designed by Zarhy Architects in 1996. Placing a library on columns and thus disconnecting it from the ground is characteristic of Modernism; but here practical considerations have also come into play: A library must bear a weight of 1,000 kg per square meter, whereas in a regular office or residential building this figure is a mere 200 kg. The library was built above an existing structure, and to avoid placing this much weight on the old structure, columns connected by long beams were installed that penetrated well beyond the line of the lower structure. Beams projecting from the plane of the ceiling are visible both on the façade of the library and in its interior. They are attached to wide circular columns on the sides of the library, leaving a column-free interior occupied only by bookshelves. The ground-floor columns have a unique design: The capital of each column is rotated at 45 degrees in relation to the column base, creating a series of triangular facets from the base to the rotated capital. The Institute’s physics buildings have undergone substantial development over the years; not only have numerous buildings been added alongside the library, but its split-level plan has come to serve as a general lobby leading in several directions. In other words, the Modernist idea of space flowing underneath a building has been fully realized here. Beneath the library is a lobby that serves as a work area for students; it is partitioned by wavy etched glass that creates a dynamic feeling reminiscent of an airport. The Arison Building for Neurobiology, designed by the architects Gershon and Barak Zippor in 1996, is a typical Postmodernist building, with the emphasis on the entrance; its marking, design and color are among Postmodernism’s most important elements. This is a simple two-story building, faced in sawn stone and built above a ground floor where installations allow for letting in natural light. It consists of two rectangular wings that resemble the wings of a bird originating from a central fulcrum – the “entrance gate,” the main focus of attention. Accessed by stairs, the entrance is topped by a round, protruding watchtower of sorts, made of glass and aluminum. The two rectangular columns supporting the entrance are emphasized well beyond the needs dictated by structural considerations (in fact, it needed no supporting columns at all, given the narrowness of the opening). The purpose of the two columns is merely to mark and accentuate the entrance. The building’s interior also has columns, which further underline the importance of the entrance but are in fact linked to the air-conditioning system. In the spirit of Postmodernism, with its fondness for the large and the exaggerated, the air-conditioning equipment, normally concealed by a low ceiling, has been transformed into a structure of columns and beams accompanying the frame, which also shows an exaggerated effort to carry on the theme of the circular entrance gate. This gate completes a circle within the building while detached from the building itself and from the balcony of the floor above. The coffered ceiling of the gateway extends to the end of it and a glass pyramid in the center of the ceiling allows light to penetrate from above. The Dwek Campus Center was designed by the architect Raphael Lerman in 1999. 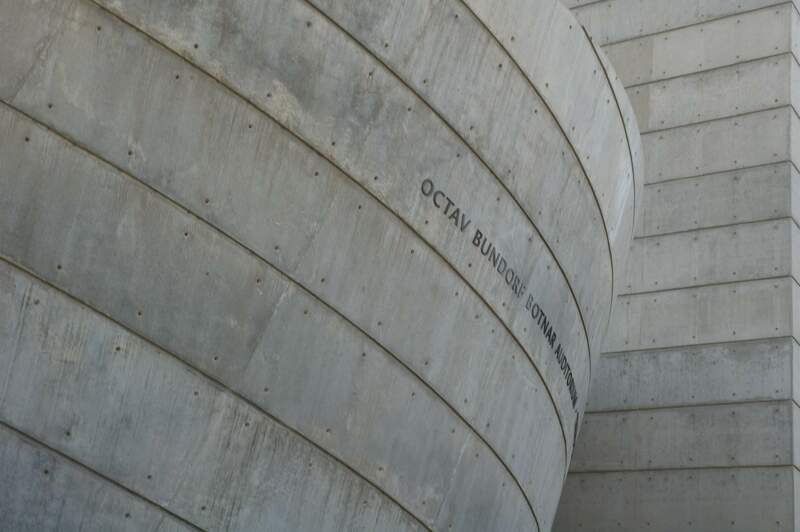 The building features a special stucco of local limestone, similar to that used in the courts of the adjacent Jubilee Plaza designed by Dan Reisinger together with the landscape architect Dan Zur. Use of the stucco was dictated by the architect’s desire to unite the components of the building and the plaza by means of a single, easily controlled material. Elsewhere in Israel, unique stucco, treated somewhat differently, has been used in Beit Hapalmach, Gan Ha’atzmaut and the Pinkas Towers in Tel Aviv. The stucco of the Dwek Campus Center is polished and porous, creating a feeling that the complex grows from the sandy ground of the surrounding orchards. The material used to pave the complex’s walkways also links the building closely with its immediate environment. A wide entrance leads to the building’s central space, which contains shops, a bank and a cafeteria overlooking the plaza. At the rear of the building are two elevated structures: one, resting on enormous walls, leads toward a rooftop observation terrace; the other descends to the verdant plaza. An elevator connecting the floors of the building is located in a separate rounded structure. Whereas the stucco of the walls and the walkways is a material connected to the local environment and to the past, the building’s glass façade and its interior design project innovation and modernity through the use of high-tech materials: Transparent glass walls face the landscape between four round columns accentuated by silver aluminum coating; and indoors is a staircase of silvery steel with a glass balustrade. Light filters into the interior through a transparent vaulted roof. The Davidson Institute of Science Education, designed by the architect Raphael Lerman in 2001, is a complex of several buildings encircling a triangular inner courtyard. Their façades are faced with sawn stone of two shades: reddish cream and gray. Connecting the buildings is an arcade of steel beams with a bluish-green, slanted glass roof resting on green steel trapeze columns tapered toward the top. Climbing plants wind along cables between the columns. In the center of the garden is a circular stone-paved area suited for outdoor group activities. This space is surrounded by the arcade, which follows the curve of the buildings, so that walking through the arcade, one’s glance does not directly follow the entire length of the wall but traces a curve that gradually reveals the façade. In the history of architecture, the arcade has become an important element that mediates between the indoors and outdoors. On the upper floors, the same mediation is performed by the open balcony. These two elements, which allow one to venture outside while staying under a building’s roof or remaining close to its wall, are also characteristic of Mediterranean architecture. The arcade performs a unifying function along the entire length of the ground-floor façade. In addition, the building is topped by a gray stone cornice resembling a massive concrete beam. It bridges the different stone structures and the glass walls marking the main entrances to buildings, thereby joining the arcade and linking the entire Davidson Institute into a single complex encircling the central square. A prominent building on the campus of the Davidson Institute of Science Education is Habarvaz Auditorium, designed by the architect Raphael Lerman in 2001 in the Deconstructionist Style. Though influenced by the design of the entire complex to which it belongs, it also stands out on its own. Like the surrounding arcade, the lobby of Habarvaz Auditorium has slanted and angular elements in its walls and ceiling. The gray walls of the surrounding buildings are echoed here in the metallic silvery aluminum plates covering the walls, columns and roof. These three basic components are related by an entire system of mutual separation and support, clearly apparent in the single corner column soaring to the height of the three floors. Glass is also a partner in this relationship, prominent in the independent and impressive entrance façade. 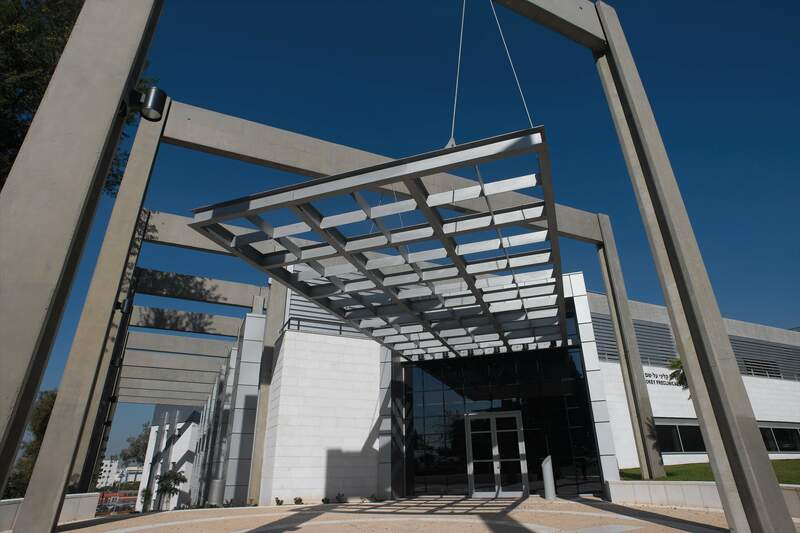 The entrance canopy is coated in aluminum and supported by a silvery steel beam. This style of construction is characteristic of buildings related to advanced, high-tech industry. The materials used call for skill and sophistication, while externally, the sparkling, silvery materials and spotlighting create an aura of distinction. The indoor stair exemplifies the high-tech style: The balustrade is of stainless steel with shiny cables, and the stairs appear to hover in midair on account of glass risers that “disconnect” one step from the next, creating a sensation of disengagement and transparency. The Arthur and Rochelle Belfer Building for Biomedical Research, designed by the architect Moshe Zur in 2002, is one of the Weizmann Institute’s most innovative buildings, characteristic of a style currently emerging in modern architecture. It can be identified by its double, semitransparent façade that vaguely hints at the contents of the building. In discussing this style, Block magazine noted the connection between modern architecture and the latest developments in medical imaging. Slightly blurry images of the body’s internal organs and their silhouettes, echoed in contemporary architectural design, are all the more appropriate on the façade of a building that houses labs devoted to molecular genetics. These features are apparent on the white glass wall next to the adjacent Octav Bundorf Botnar Auditorium and on the transparent glass wall containing the front entrance. Behind this wall the body of the building itself recedes to create a tall entrance lobby with white rolldown shades that cover two floors each and four balconies running along the upper floors. Additional elements characteristic of this style are the entrance canopy made of etched glass and the white frame of the transparent façade. This frame, built of round columns and beams disconnected from the glass, is meant to resemble, in its whiteness and the roundness of its outline, the skeleton of a prehistoric creature. This light façade of transparent glass forms one of the sides of the stairwell and is in sharp contrast to the stairwell’s other side, made of slabs of exposed concrete cast in industrial beds, similar to the adjacent Botnar Auditorium. The transparency makes it possible to see the people on the staircase as if they were behind a thin screen. A two-tier bridge connects the upper floors with the next-door building, allowing scientists to move conveniently between the two. The staircase itself is one of the central elements of the design, not only from the point of view of its function and frontal location but also in terms of it being a vertical component that breaks up the elongated outline of the rest of the building. In its lower part, the building’s contour doesn’t reach the floor but follows the layout of the staircase, which, in turn, appears to be hovering above ground. An artistic wall relief by Rina Haikin in the entrance lobby depicts the chromosomes of the human genome. The Octav Bundorf Botnar Auditorium, designed in 2002 by the architect Moshe Zur, resembles an oversize snail clinging to the corner of the Arthur and Rochelle Belfer Building for Biomedical Research, much like a snail clings to a stalk, except that the “stalk” in this case is made of exposed concrete and glass. As befits a stalk, the Belfer Building “feeds” the auditorium through the lobby on its ground floor. To enter the auditorium, one passes between two exposed concrete columns cast in a protruding spiral mold, echoing the auditorium’s outer wall and resembling a snail’s shell. This “shell” extends from the Belfer Building, its rounded wall accentuating the prominent seams between the slabs, which flow inward and downward, lending a cone shape to the exterior walls. This slanting, rounded outer wall helps to create a feeling of space and spiritual uplift on the inside. The unique, attention-grabbing shape of the auditorium can be seen as a current interpretation of the architectural principle “form follows function” formulated by the noted Modernist American architect Louis Sullivan, according to which a building’s design stems from its intended function. Consequently, the outer envelope of the windowless auditorium is made of exposed concrete – a task-oriented, no-nonsense material suggesting nothing more than efficient function. Where the round structure of the auditorium penetrates the straight-lined entrance lobby of the host building, the concrete is replaced by a wooden-walled bookcase that faces the lobby and provides the auditorium with essential acoustic insulation. The auditorium’s rounded interior is also in the spirit of Modernism. From the 12 seats of the first row, the seating fans out gradually, so that the sixth and last row, which stretches along the perimeter of the auditorium, has 18 seats, bringing the total seating capacity to 100. The technical rooms are located behind the back wall. In striking contrast with its gleaming, tough, ascetic exterior, the inside of the auditorium, with its soothing carpet, light-gray high-quality chairs and lighting concealed within the low ceiling, provides a soft, pleasant and inviting place. Just like a snail ensconced in its shell. The Joe Weinstein and Major Max L. Shulman Eco-Sphere in the Clore Garden of Science was designed by the architect Dan Peleg in 2003. It is a geodesic dome, modeled after the one first built by famed U.S. architect, engineer and inventor Richard Buckminster Fuller in 1949. Since then, geodesic domes have been used for a variety of purposes. One example was the U.S. pavilion at the 1967 International and Universal Exposition (Expo 67) in Montreal. Domes, in general, are strong and stable (the sphere being the strongest structure in nature), but building them is extremely complicated. The domes of churches and synagogues – such as those in Milan’s Duomo or the Great Synagogue of Tel Aviv – have therefore always been considered architectural feats. Fuller, however, found a way to build domes using only flat components – pentagons and hexagons: an approach that is relatively easy to implement. The resultant structure, called a geodesic dome, was received with such enthusiasm that at one point Fuller even suggested building an enormous dome to cover all of Manhattan. In the Clore Garden of Science, a unique open-air science museum, the geodesic dome serves to demonstrate the various principles of ecology and the study of the environment, hence its name: the EcoSphere. The EcoSphere is built of black aluminum fitted with glass plates, so that its outer surface is a smooth glass envelope. The hothouse effect produced inside is offset by a network of sensors that control the air-conditioning system installed underneath the structure and release air through large mesh columns. The temperature inside the dome is set at 25oC and the humidity at 50% to 60%. This microclimate makes it possible to grow a variety of plants, some of which also grow outside the EcoSphere, thus allowing visiting students to observe the effects of climate difference on plant growth. In addition, the facility provides students with a hands-on learning experience about the world’s water economy and nature’s food networks. The Lorry I. Lokey Preclinical Research Facility was designed by the architect Zadok Sherman in 2008; the architect Raphael Lerman participated in the design of the external arcade and the roof. The building’s bright and shiny modern construction materials, along with its contemporary design, reveal that this is a new addition to the campus. Attention is immediately drawn to the corrugated metal of the upper floor, a component borrowed from industrial warehouses that has only recently come into use for facing non-industrial buildings. The use of this material was pioneered by the architect Frank Gehry, who in 1978 incorporated it in his private home in Santa Monica, California. Thirty years later, in the Weizmann Institute’s Lokey Facility, such metal work, executed at a much higher level of quality and detail than in Gehry’s house, has been supplemented by square aluminum plates. Gehry’s irregular shapes have also given way to much cleaner, straighter lines. Concrete frames are the building’s distinguishing feature. They envelop the facility on all sides, starting with the single concrete column on the street corner opposite the entrance, and from there they spread out while defining the entrance via a steel pergola suspended from the beams on steel cables. The beam above the entrance is echoed by the arcade on the building’s western side, above the sidewalk leading to the entrance (each concrete column conceals a gutter and street lighting). On the southern side, this beam is integrated within the building’s façade as a roof and concrete columns. In addition to the concrete and the silver-colored metal, this side also includes light-colored sawn stone, as well as a steel beam above the long ribbon window, which accentuates the horizontal dimension emphasized repeatedly elsewhere in the building. 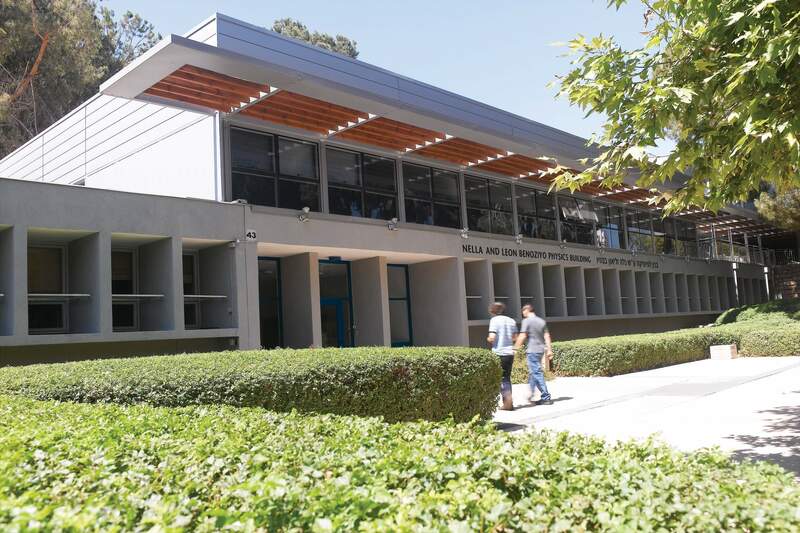 The Nella and Leon Benoziyo Physics Building was created when, in 2008, the architects Avi Livay and Yoel Dvoriansky added a second floor above the one-story wing that connected the physics building with the particle accelerator laboratories. 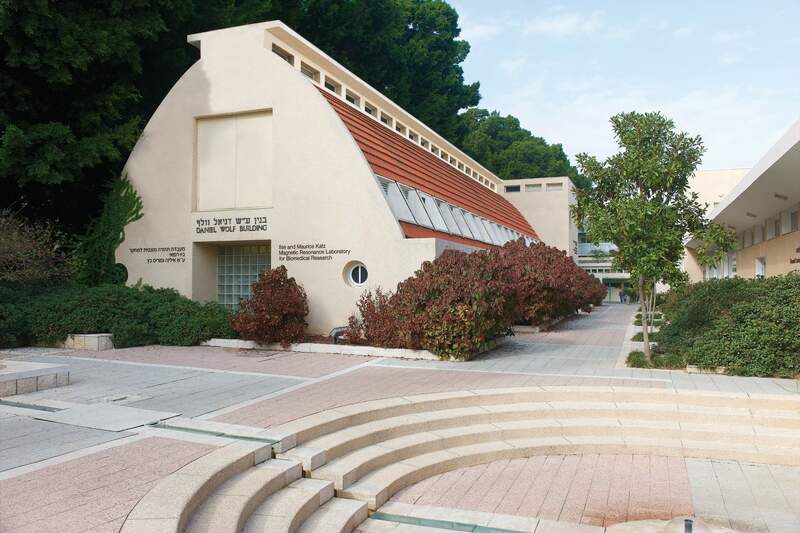 The original one-story wing, designed by the architects Moshe Harel and Nahum Zalkind in 1963, was constructed of concrete with a gray plaster facing covering the walls and the shading ribs, which protrude about one meter beyond the narrow, recessed windows. Due to the topography, the original one-story structure is at a lower level than the rest of the physics faculty buildings, including the entrance floor of the Nella and Leon Benoziyo Physics Library. The decision to build the new wing as a light, airy structure stemmed mainly from engineering but also from design considerations. The different style and materials make it clear that this floor was added long after construction of the original one-story wing. Adding new construction to an existing building is commonplace these days. The question is whether the new addition should adapt to the historic style or use entirely new materials, colors and style, clearly demarcating the new from the old. There is no ideal answer to this dilemma. Jerusalem exemplifies the strict, new-adapts-to-the-old approach, while Tel Aviv is more flexible, combining the historic style of the first floor with upper floors built in a modern style and incorporating such materials as wood, aluminum and glass that contrast with the rest of the façade. The new wing of the Benoziyo Building is an interesting combination of the two approaches. On the one hand, its style and construction method are modern and high tech, with the emphasis on lightness: minimal, 20x 20-cm columns; gypsum walls; windows that extend from floor to ceiling and from one column to the next; an aluminum-panelled façade; a steel pergola; tie-rods extending to the roof; and wooden panels. On the other hand, the new elements are adapted to the existing building: the division of the façade into modules matches the lower-floor windows; gray is the prevailing color for everything except the wood (to match the lowerfloor stucco); and, in addition, the pergola’s row of wooden beams continues to the adjacent physics library building. 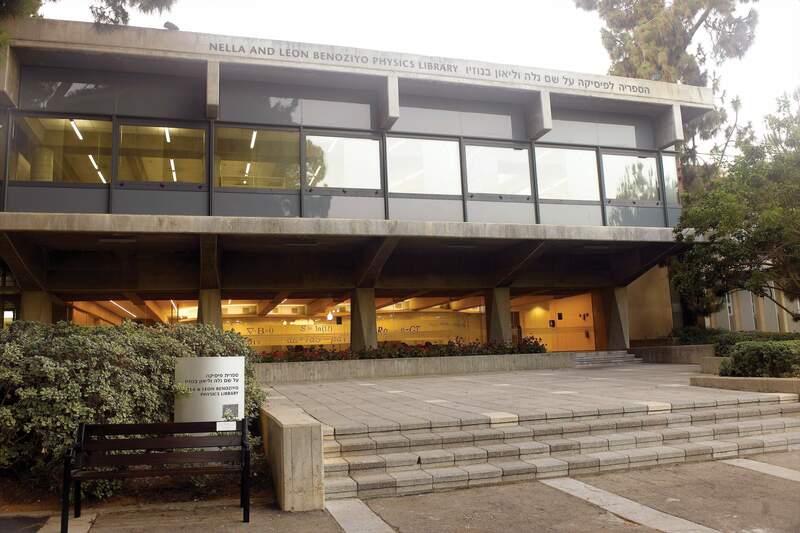 The Feinberg Graduate School was designed by the architects Benjamin Idelson and Gershon Zippor in 1965 as a building comprising three simple rectangular sections connected by a corridor. In 2009, the architects Gershon and Barak Zippor made changes to the building. In altering the front entrance, they used light materials – a steel frame and insulating aluminum plates for the walls – so as not to encumber the existing structure. In this manner, they gave the building a modern look with more rounded lines, thus softening and breaking up the original building’s simple boxlike appearance. In altering the building, its flat roof was replaced by a barrel vault of the same light materials, spanning the building’s center for several meters without columns. In the area of the main entrance the roof assumes the shape of a giant wave that surges forward to serve as an accentuated entrance canopy. Similarly, five square elements, each emphasized by a prominent white frame and a large glass window, also extend beyond the borders of the gray box, serving the five research schools of the Feinberg Graduate School. In contrast to the original building, in which the rooms were arranged along one side of an elongated corridor, the offices, as well as a lecture hall, are now arranged around a central space, illuminated by natural light from above. The David Lopatie Conference Centre, which includes the Barbara and Morris Levinson Visitors Center, is located in the building that in the past housed the Edith and Abraham Wix Central Library, which was rendered redundant as a result of switching to on-line resources now available to scientists via the Institute’s internal computer network. The original building, designed by the architect Arieh Elhanani in 1958 in the Modernist-Brutalist Style, included an exposed concrete framework hovering above ground, with precast vertical shading panels. The roof has pyramid-shaped structures that provide both height and strength. The façade is supported by four asymmetrically placed round columns: three on the western side and one in the eastern corner of the building. The concrete load-bearing wall between the columns is faced with a bluish mosaic that matches the door and window frames on the façade. The side wall, as well as the underside of the ceiling on the façade, has exposed concrete panels characteristic of the Brutalist Style. The main difficulty in casting such panels is a lack of precision in the casting beds due to problems of size, causing variations in the consistency of the slabs. The solution is to create permanent seams between the panels in advance, to stress that the casting was done peacemeal. In addition, temporary wooden surrounds shaping the panels during casting are placed alternately horizontally and vertically; when the surrounds are removed, the concrete slabs “remember” their positioning. The quality of the casting will determine the ability of the building to withstand the test of time. Supervising the adaptation of the building to its new function is the architect Amir Kolker. Benjamin Chaikin was born in St. Petersburg, Russia, in 1883. He completed his studies in architecture in England, where he designed a number of buildings before World War I, during which he served as an officer in the Corps of Royal Engineers. He immigrated to Eretz Israel in 1920 as a British citizen and opened his own firm in Jerusalem. The buildings he designed for wealthy public figures and British government representatives were characterized by their meticulousness, respectability and majestic splendor. Even though Chaikin did not identify with the International Style, which reigned in the world of architecture at the time, he avoided frivolous decorations and designed respectable-looking buildings with pleasant, modest proportions, in the spirit of Modernism. Chaikin designed the King David Hotel in Jerusalem, in collaboration with the Swiss architect Emil Vogt and the interior designer architect G.H. Hufschmid. He also designed the municipality building in Haifa and the Daniel Sieff Research Institute in Rehovot (1934), which later gave rise to the Weizmann Institute of Science. He died in Jerusalem in 1950 and is buried in the Givat Ram (Sheikh Badar) Cemetery. Yoel Dvoriansky was born in Israel in 1973, pursued architectural studies within the framework of the Israel Defense Forces’ atuda army study program, and served in the Air Force construction department as head of projects and of the planning division. He then worked in the firm of the architect David Yanai. Having graduated with honors from the architecture faculty of the Technion – Israel Institute of Technology in 1995, he established a firm in partnership with the architect Avi Livay in 2001. The firm works in a variety of fields, including projects for the Israel Ministry of Defense. They also won the design competition for a museum and exhibition hall for Rafael Advanced Defense Systems Ltd. in northern Israel. In the civilian sector, the firm has been responsible for designing the Israel Railways control center in Haifa (2008) and the main branch of Bank Leumi in Jerusalem (2009), among other projects. They have also designed the building for the Israel embassy and ambassador’s residence in Montevideo, Uruguay, and the interior of the Tel Aviv-Yafo municipality building. 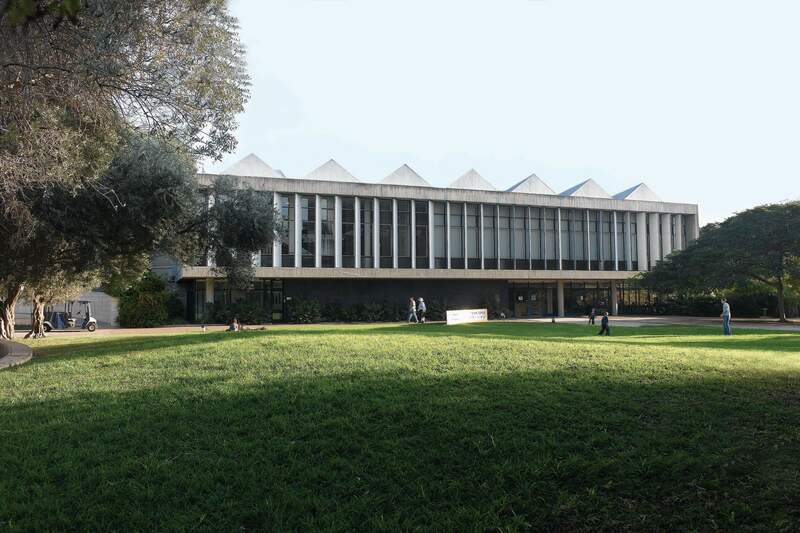 At the Weizmann Institute of Science, the architects have designed the Nella and Leon Benoziyo Physics Building (the addition of a second floor to the existing structure) and the new lobby for the physics building (under the Nella and Leon Benoziyo Physics Library). Arieh Elhanani was born in 1898 in Ukraine, and completed his architecture studies at the School of Art and Architecture in Kiev in 1917. In addition to working as an architect, he designed theater sets and engaged in sculpture, typography and graphic design (his work in this area includes the logos of the Palmach and the Israel Defense Forces). Elhanani made aliya in 1922 and settled in Jerusalem. His combination of art and architecture brought him to the peak of his career – designing and managing the site of the international Levant Fair held in Tel Aviv in 1934, including the design of some of the Fair’s buildings and sculptures. Elhanani created “The Hebrew Laborer,” an 8-meter-high concrete sculpture in the style of Russian Constructivism. Among the buildings designed by Elhanani are the Hall of Remembrance in Yad Vashem (in collaboration with Arieh Sharon and Benjamin Idelson), the municipal auditorium in Kfar Saba and the Gan Ha’ir Tower in Tel Aviv. At the Weizmann Institute of Science, Elhanani designed the Wix Library, the Jacob Ziskind Building, the Charles Clore International House, the Stone Administration Building and the Isaac Wolfson Building. Elhanani was awarded the 1973 Israel Prize in architecture for his contribution to shaping Israeli culture. He died in 1985. Moshe Harel was born in 1920 in Sittard, the Netherlands. In 1942 he completed his studies in architecture in Rotterdam and joined the Dutch resistance that fought the Nazi occupation, an activity for which he received a medal of valor from General Eisenhower. A year after immigrating to Israel in 1950, Harel started working for the architect Lotte Cohen. In 1953 he moved to the firm of the architect Nahum Zalkind and immediately became a partner in that firm, which specialized in designing science and research buildings. Harel designed numerous buildings at the Weizmann Institute of Science, including the Danciger Power Center, the Ullmann Building of Life Sciences, the Ernst David Bergmann Institute (which formed the basis for the Helen and Milton A. Kimmelman Building), the biodynamics building (today the Max and Lillian Candiotty Building), Arnold R. Meyer Building, the Harry Levine Family Building and the Dannie N. Heineman Laboratory. When Zalkind left the firm in 1967, Harel remained alone. At the Weizmann Institute, he designed the Koffler Accelerator and the Canadian Institute for the Energies and Applied Research (“the solar tower”). 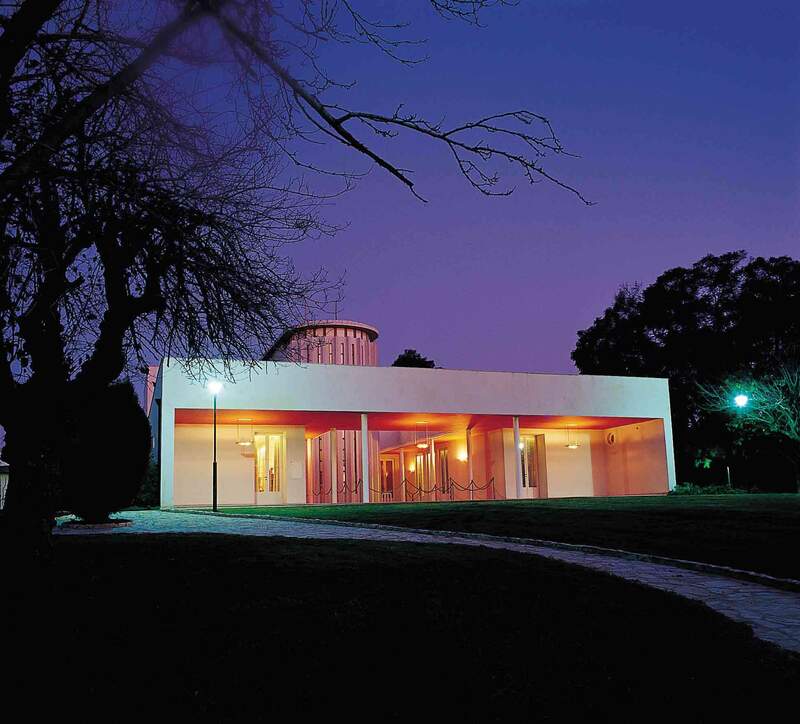 In designing the latter building, he collaborated with the artist Dani Karavan, who contributed the design of the building’s façade and landscape planning. Harel retired in 1992 and died in 2001. Benjamin Idelson was born in Russia in 1911. From 1948 to 1964 he was a partner of the architect Arieh Sharon. They designed buildings in the styles of Minimalism and Functionalism, in line with the spirit of the time – the austerity period in the young State of Israel. Their well-known projects from that period include the Soroka Medical Center in Beersheba and the Jewish Agency building on Tel Aviv’s Kaplan Street. Idelson and Sharon won the 1957 Rokah Prize for designing the Beit Lessin Theater in Tel Aviv. In 1964 Idelson parted ways with Sharon and opened a firm in partnership with the architect Gershon Zippor. He worked in that firm until his death in 1972. Among his most important projects from that period are the London Ministore tower in Tel Aviv and the Ammunition Hill memorial in Jerusalem. 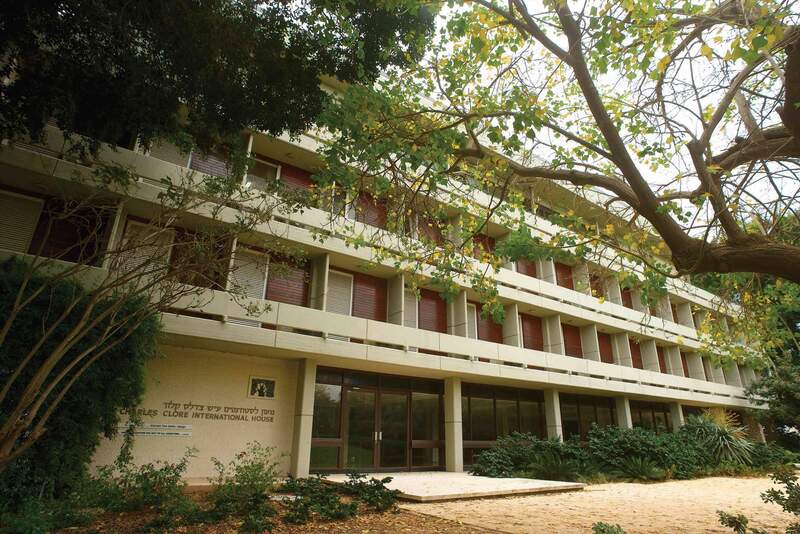 At the Weizmann Institute, Idelson took part in designing the Feinberg Graduate School, the Michael and Anna Wix Auditorium, the Perlman Chemical Sciences Building, the Weissman Building of Physical Sciences, the Wolfson Building for Biological Research, and the San Martin Faculty Clubhouse and Hermann Mayer Campus Guesthouse – Maison de France. He won the Israel Prize in architecture in 1968; he died four years later, in 1972. Raphael (Rafi) Lerman was born in Jerusalem in 1936 and moved with his family to Tel Aviv at the age of nine. He served in the Airborne Nahal unit of the Israel Defense Forces and was a member of Kibbutz Yad Hannah. After a stint as a tour guide, he worked in the firm of landscape architect Josef Segal before enrolling in architecture studies at the Technion – Israel Institute of Technology. After the Six-Day War, Lerman opened his own firm with his wife, the architect Edna Lerman. He undertook numerous national and regional master plans, as well as several for the Weizmann Institute of Science. Lerman has designed a number of residential neighborhoods, among them Ramat Beit Hakerem in Jerusalem, “Dutch Rehovot” in Rehovot, “House and Country” in Givat Shmuel and the 16th Quarter in Ashdod. 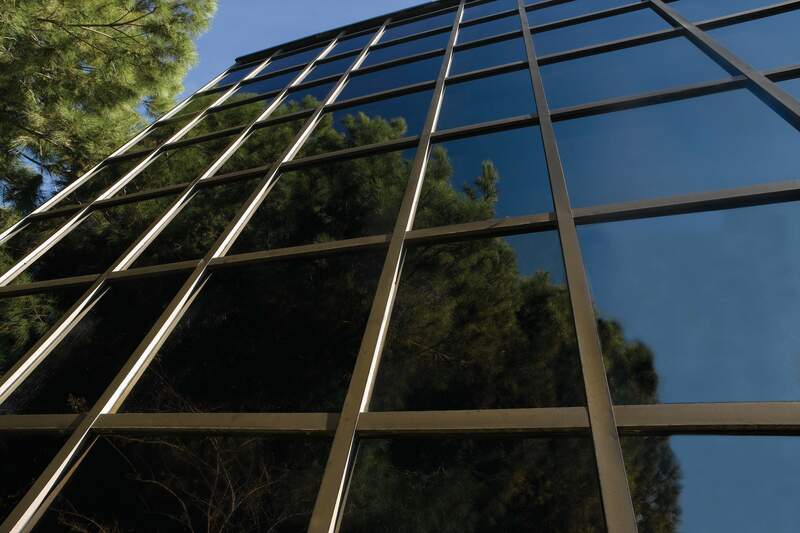 In parallel, Lerman designed offices and public buildings, including the Ziv Towers in Tel Aviv and the EuroPark in Yakum, which won excellence awards from the Association of Contractors and Builders in Israel in 2002 and 2004, respectively. 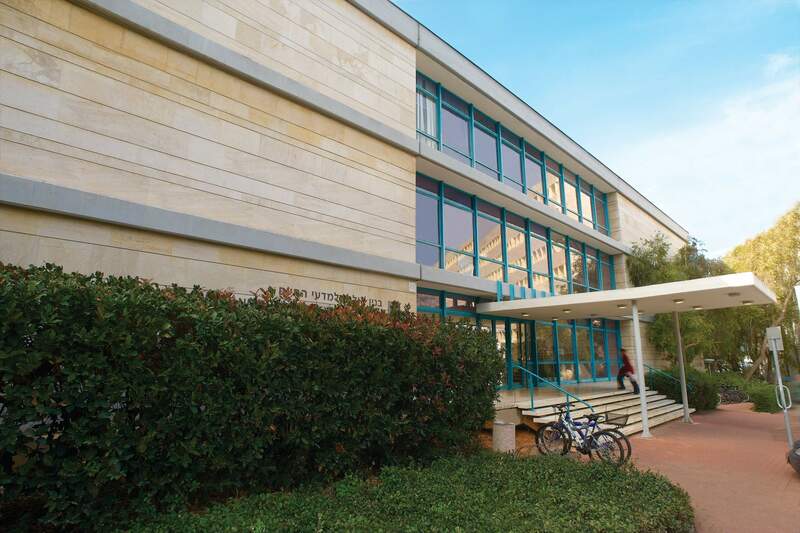 At the Weizmann Institute of Science, the buildings he designed include the Davidson Institute of Science Education and the Sussman Family Building for Environmental Sciences; he has also served as a consultant in preparing a master plan for the Institute. Lerman coordinated the activities of the conservation council in southern Israel from 1985 to 1992. In 2005 he earned the title of Honorary Planner from the Israel Planners Association. Avi Livay was born in Israel in 1965. He worked in the firm of Giora Ben-Dov, later in the firm Yaski Sivan Architects, and taught architecture in Askola-Meimad College. He earned a degree in architecture with honors from the Technion – Israel Institute of Technology in 1995 and established a firm with the architect Yoel Dvoriansky in 2005. The firm works in a variety of fields, including projects for the Israel Ministry of Defense. They also won the design competition for a museum and exhibition hall for the Rafael Advanced Defense Systems Ltd. In the civilian sector, the firm has been responsible for designing the Israel Railways control center in Haifa (2008) and the main branch of Bank Leumi in Jerusalem (2009). They have also designed the building for the Israel embassy and ambassador’s residence in Montevideo, Uruguay, and the interior of the Tel Aviv-Yafo municipality. 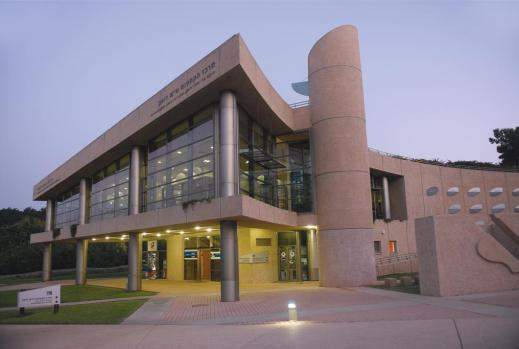 At the Weizmann Institute of Science, the architects designed the Nella and Leon Benoziyo Physics Building (the addition of a second floor to the existing structure) and the new lobby for the physics building (under the Nella and Leon Benoziyo Physics Library). Erich Mendelsohn, one of the most important Jewish architects of the twentieth century, was born in Allenstein, Prussia (now Olsztyn, Poland), in 1887. One of the founders of Modernism, he is known for his dynamic expressionist style, deriving inspiration from organic shapes in nature. He received architectural training in Berlin and Munich, where he became familiar with Expressionism in art, which was reflected in the building that won him worldwide recognition: the Einstein Tower, a solar observatory built in the early 1920s in Germany. When the Nazis came to power in 1933, Mendelsohn fled Germany and divided his time between England and Palestine. 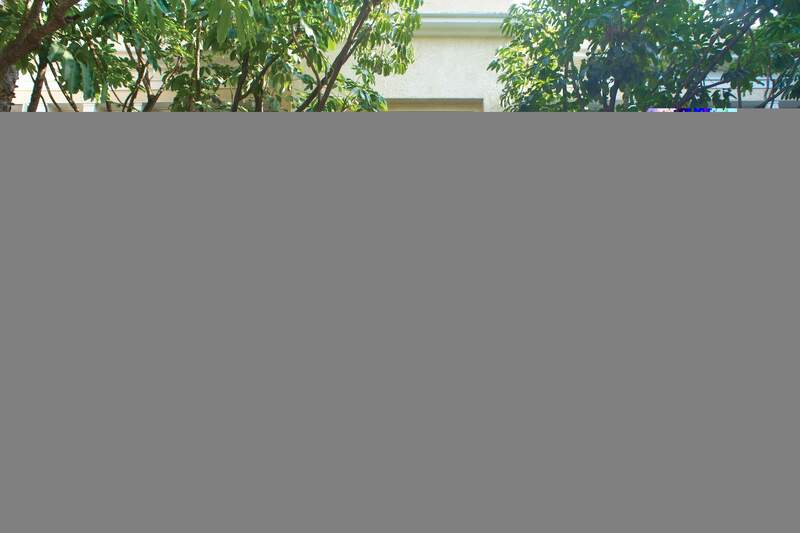 In 1936 he designed his first building in Israel, the private house of Dr. Chaim Weizmann in Rehovot. It was followed by various research buildings for the Daniel Sieff Research Institute, which later became the Weizmann Institute of Science. Yet during the same period, Mendelsohn’s curved shapes began to adapt to the need to provide fast, cheap construction for the masses. 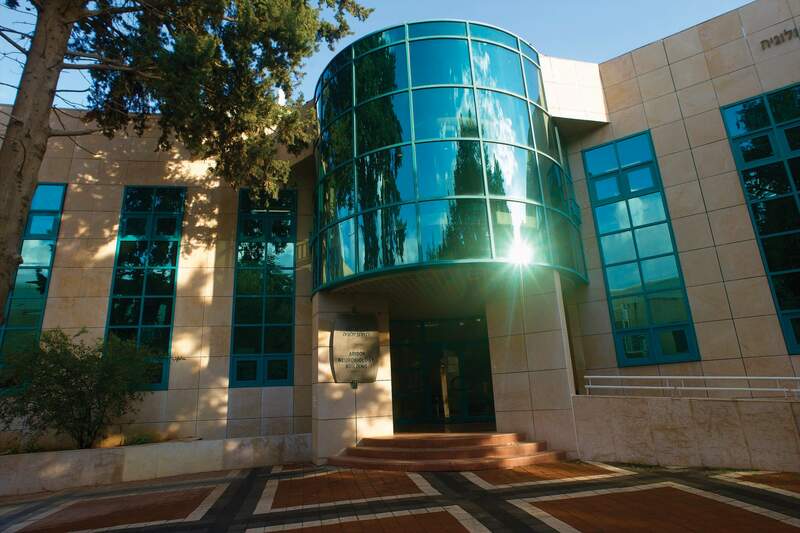 Additional prominent buildings Mendelsohn designed in Eretz Israel include the Schocken House and Schocken Library in Jerusalem, the Hadassah University Hospital on Jerusalem’s Mount Scopus and the Rambam Medical Center in Haifa. In 1941 he left Eretz Israel and settled in the United States, where he opened an architectural firm, lectured in universities and published articles in architectural journals. He died in San Francisco in 1953. Dagan Mochly was born in 1957 in Haifa and now lives in Ein Hod. He completed his studies in architecture at the Technion – Israel Institute of Technology with honors in 1984, and in 1986 earned a master’s degree. In 1987 he received a scholarship for studying conservation in Italy and worked there for two architectural firms. In Israel, he worked mainly in the firm of his father, the architect Josef Mochly, which in 1996 became Dagan Mochly Architects Ltd. (with associate architects Dror Sdomi, Ziva Eilam and Ofer Zaid). In 2008, Dun & Bradstreet ranked it ninth among architectural firms in Israel. Among the projects it has designed are research laboratories, high-tech buildings and food and pharmaceutical industry buildings. It also designs “green” buildings, such as the Intel building in Haifa (in planning stages). At the Weizmann Institute of Science, the firm has designed the interiors of the Sussman Family Building for Environmental Sciences, the laboratories in the Helen and Milton A. Kimmelman Building and the Arison Building for Neurobiology. The firm’s experience in conservation was applied in the reconstruction of three buildings at the Institute designed by Erich Mendelsohn: the Daniel Wolf Building, the Helen and Martin Kimmel Center for Archaeological Science and the Ruthie and Samy Cohn Building for Magnetic Resonance Studies in Structural Biology. In 1997, Mochly presented his “Hotel in the Old City of Acre” at the Venice Biennale; he also presented his work at the Milan Triennale. Dan Peleg was born in Poland in 1937. A year before his birth his family bought property in Tel Aviv, but decided to postpone their aliya to Eretz Israel. During World War II almost all the members of the family perished in the Holocaust. Dan and his brother survived in hiding, disguised as Christian children, and in 1946 a distant family member brought them to Eretz Israel. At the age of nine, Dan arrived at Kibbutz Sha’ar Ha’amakim. After completing his army service, he started working in construction on the kibbutz. Peleg then studied construction engineering at the Technion – Israel Institute of Technology, graduating in 1964. In 1976, he earned a master’s degree in architecture from the prestigious Pratt Institute in New York. In the United States, he worked in the firm of Ada Karmi- Melamede, and upon his return to Israel, he worked initially in the technical department of Hashomer Hatzair. In 1992, he created his own private firm. Dan Peleg has worked on a broad range of projects, from science and recreation parks (Weizmann Institute of Science, Kibbutz Sha’ar Ha’amakim), to buildings intended for educational and cultural purposes, residences, healthcare institutions and construction projects for kibbutzim and moshavim. His office is managed today by his son, the architect Amos Peleg. Yakov Rechter, born in Tel Aviv in 1924, was the son of Ze’ev Rechter, one of the fathers of Israeli architecture. After completing his architecture studies at the Technion – Israel Institute of Technology in 1952, Yakov joined his father’s architectural firm. Among his five children are the actress Dafna Rechter and the musician Yoni Rechter. Rechter’s architecture is Modernist in style; he preferred to use hard, traditional materials, such as stone and concrete, while taking into account environmental conditions. His Mivtahim Inn in Zichron Ya’akov was awarded the Israel Prize in architecture in 1972. He designed numerous public buildings and structures in Tel Aviv, including the Frederic R. Mann Auditorium (1957) and the Performing Arts Center (1994). Outside of Tel Aviv, his works include the Maurice and Gabriela Goldschleger Life Sciences Library, the Lunenfeld-Kunin Residences for Visiting Scientists and Europe House on the campus of the Weizmann Institute of Science. The Israel Ministry of Education awards the Rechter Prize – second only to the Israel Prize in its importance in local architecture – in his and his father’s memory. Since his death in 2001, his firm has been managed by his son, the architect Amnon Rechter. Arieh Sharon was born Ludwig Kurzmann in Poland in 1900. He immigrated to Israel in 1920, underwent agricultural training and became one of the founders and planners of Kibbutz Gan Shmuel. He designed the kibbutz dining room before even qualifying as an architect. In 1926 he left the kibbutz to study architecture in the Bauhaus school in Dessau, Germany, and worked in the firm of the school’s director, the architect Hannes Mayer. Upon returning to Eretz Israel in 1926, he opened a private firm in Tel Aviv and started designing buildings in the new International Style he had adopted while at the Bauhaus. His extensive ties with the government allowed him to leave his imprint on Israel’s urban landscape. In the years 1949 – 1953, Sharon, considered one of the fathers of Israeli architecture, designed the country’s first master plan, which laid down the building principles and defined future areas of construction. He also took part in Israeli projects abroad, designing the University of Ife in Nigeria. From 1950 to 1964, he worked in partnership with Benjamin Idelson, and later in partnership with his son Eldar. For his extensive activities, he was awarded the Rokah Prize and the first Israel Prize in architecture (1962). He died in Tel Aviv in 1984. The family firm, specializing in designing medical centers, is managed today by his grandson Arad. Zadok Sherman was born in Russia in 1944 and immigrated to Israel in 1949. He completed his architecture studies at the Technion – Israel Institute of Technology in 1967, then served for four years in a construction center of the Israel Defense Forces as a planning officer and head of the army base construction division. For two years after his army service, he was a partner in Shimor-Sherman Architects. From 1974 to 1977 he was a partner in A.C.D. Architectural Design. In 1977 he established his own firm, which operated until 1981. That year he established the Sherman Potash Architects Ltd., which he headed until 2006. Within this framework, he designed such military installations as the Hebrew school building at Mechva Alon army base (1996). He served as Chairman of Consulting Architects and Town Planners (2001 – 2004). In 2006 he became the founder and CEO of Sherman Architecture & Programming Ltd., where he programmed national projects for the Israel Defense Forces in the Negev (a training base complex, a technological campus) and plans for recreational areas. At the Weizmann Institute of Science, he designed the Nella and Leon Benoziyo Building for Brain Research (1992), the Helen and Milton A. Kimmelman Building (together with Gershon Zippor, 1994), the Camelia Botnar Building (1999) and the Lorry I. Lokey Preclinical Research Facility (2009). Nahum Zalkind was born in Russia in 1895 and completed his architecture studies at the Imperial Academy of the Arts in St. Petersburg in 1917. He emigrated from Russia to Berlin, where he designed, among other buildings, the Gloria Cinema. With the rise of the Nazis to power in 1933, he immigrated to Eretz Israel. In 1934, together with a colleague, he won the competition for designing the new central bus station in Tel Aviv. The station was considered to be the most sophisticated of its kind at the time. In the 1930s and 1940s, Zalkind designed a variety of buildings. In 1947 he won the competition for designing the Dov Hoz Stadium in north Tel Aviv, a project that was never realized. A year later, with the establishment of the State of Israel, he was a member of the government’s Planning Department headed by Arieh Sharon. In 1953 Zalkind opened his own architectural firm. In 1954, the architect Moshe Harel joined him as a partner. In 1957, Zalkind served as a judge in the public competition for designing a permanent home for the Knesset. 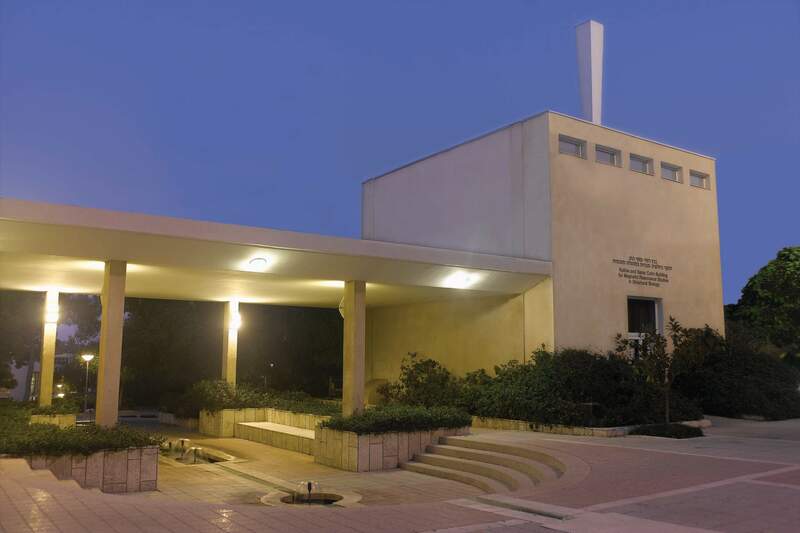 At the Weizmann Institute of Science, Zalkind took part in designing several buildings, including the Michael and Anna Wix Auditorium and the Edna and K.B. Weissman Building of Physical Sciences (both in collaboration with Arieh Sharon and Benjamin Idelson). Together with Moshe Harel he designed, among other buildings, the Ullmann Building of Life Sciences. He died in 1976 at the age of 81. Moshe Zarhy was born in Jerusalem in 1923 and completed his studies in architecture at the Technion – Israel Institute of Technology in 1945. About five years later he obtained a degree from École d’Urbanisme in Paris. In 1950 he joined the firm of Ze’ev Rechter as a partner, and in 1959 became a partner of Rechter’s son, Yakov. In 1970 he opened his own firm, which in 1979 was joined by his son David Zarhy and daughter-in-law Anat Patrycha Zarhy. Today the firm employs about 20 architects and is engaged in a variety of projects, including master plans, public institutions and private residences. Among the firm’s major projects are the Yanko Dada Museum in Ein Hod (1983), the Central Zionist Archives in Jerusalem (1987), the Sheba Medical Center at Tel Hashomer, and the 140,000-square-meter Weizmann Center near the Tel Aviv Sourasky Medical Center. At the Weizmann Institute of Science, among the buildings the firm’s architects have designed are the Hermann and Dan Mayer Building for Semiconductor Science and the Nella and Leon Benoziyo Physics Library. They have also designed the Rabin Industrial Park in Ness Ziona, adjacent to the Weizmann Institute, in collaboration with the Africa-Israel Group. Gershon Zippor belongs to the generation of architects who were among the founders of the State of Israel. The scope and style of his work evolved together with the development of Israeli architecture, from Functionalism and Brutalism to modern high-tech architecture. He was born in Tel Aviv in 1931, completed his studies in art at the Avni Institute in 1948 and his studies in architecture at the Technion – Israel Institute of Technology in 1957. He was then employed for seven years, until 1964, in the architectural firm of Arieh Sharon and Benjamin Idelson. When the partnership between those two architects was dissolved, Zippor joined Idelson as a partner. After Idelson’s death in 1972, Zippor worked independently until 1990 when he joined the firm of his son, Barak Zippor, a graduate of École Spéciale d’Architecture in Paris. Zippor Architects Ltd. has been responsible for designing hundreds of buildings. 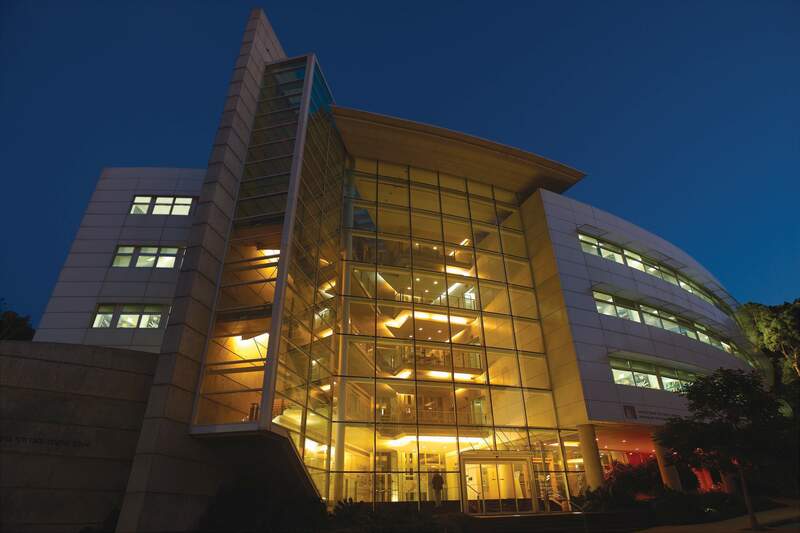 Zippor has designed numerous and varied buildings for the Weizmann Institute of Science, including the Arison Building for Neurobiology, the Wolfson Building for Biological Research, the Perlman Chemical Sciences Building and the Feinberg Graduate School (in two stages). Zippor has received many awards, including the 1998 Rechter Prize, and served as Chairman of the Israeli Architects Union for many years. In 2005, he was named Yakir (Honorary Resident) of Tel Aviv. Moshe Zur was born in Tel Aviv in 1948, studied architectural engineering in the ORT technical school in Givatayim, then obtained a degree in architecture with honors from the Technion – Israel Institute of Technology in 1974. He founded his own firm in 1978. In 1983, his wife, the architect Orna Zur, joined the firm, which has three additional partners and about 45 employees. The firm designed more than 800 varied projects, characterized by their large scale, their complexity and the use of advanced technology and high-quality construction. Many of Zur’s projects have won awards, among them the Rechter Prize (for the design of the Elbit Systems building in the MATAM science park, Haifa); first place in the international contest for planning the Tel Aviv Port area and the old Exhibition Grounds (with Prof. Herman Hertzberger from the Netherlands); and the Haifa municipality’s Quality House Prize (for the Bat-Galim office building). In 2003, the Council for a Beautiful Israel awarded him the Yakir and Magshim Award for designing the Children’s Museum in Holon; and the Association of Contractors and Builders in Israel presented him with a public buildings award for designing the Belfer Building for Biomedical Research at the Weizmann Institute of Science.